I left Ivor’s house and caught the train back to Moreton on The Wirral. 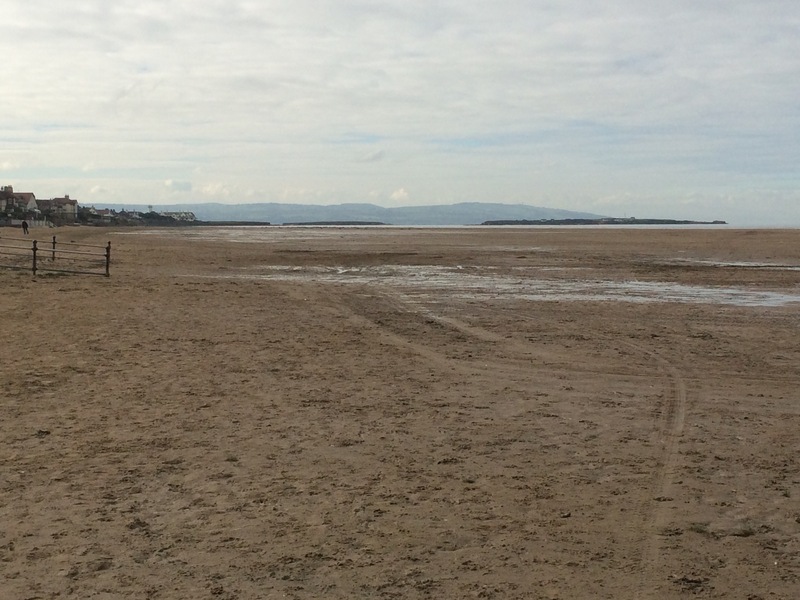 It was a fine and calm day so the sea was like glass as I walked along the front at Hoylake. 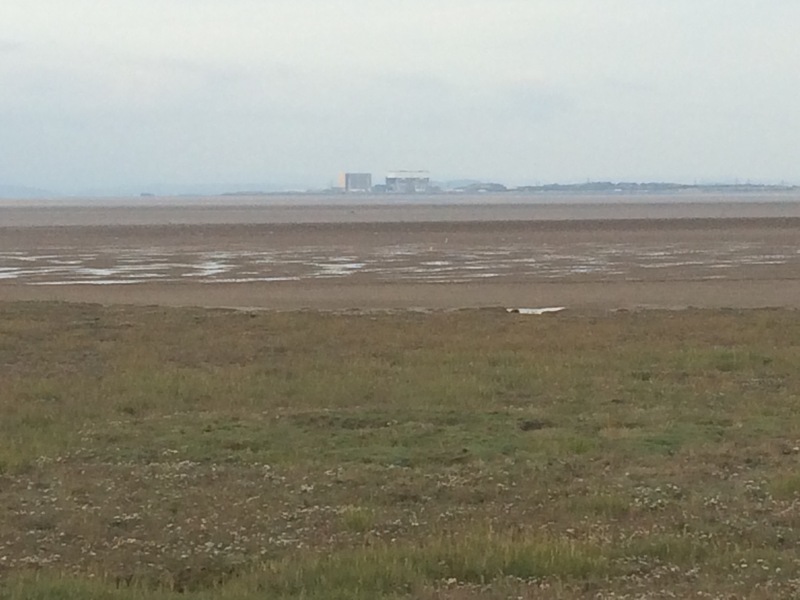 I could see Wales pretty clearly and in between were 3 small islands at the mouth of The Dee. 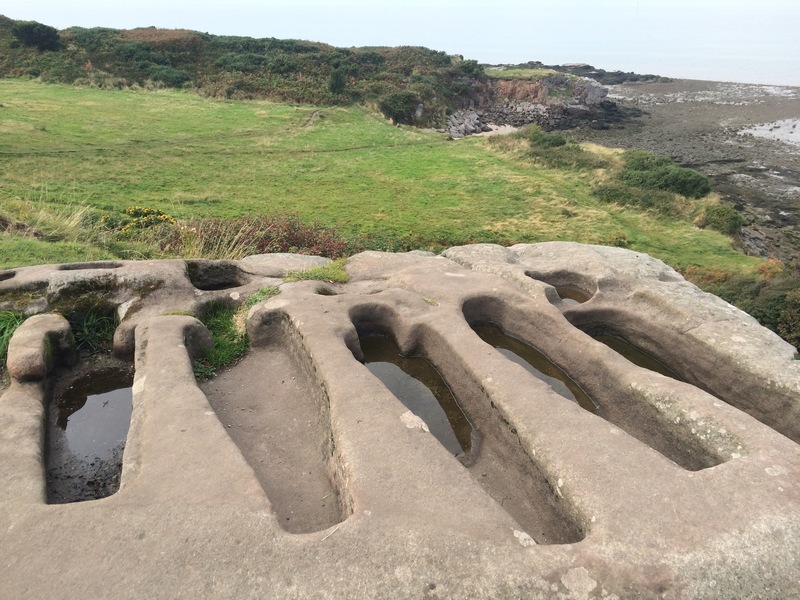 I was surprised to see houses on the largest island, Hilbre, which was cut off from Wirral by the high tide. 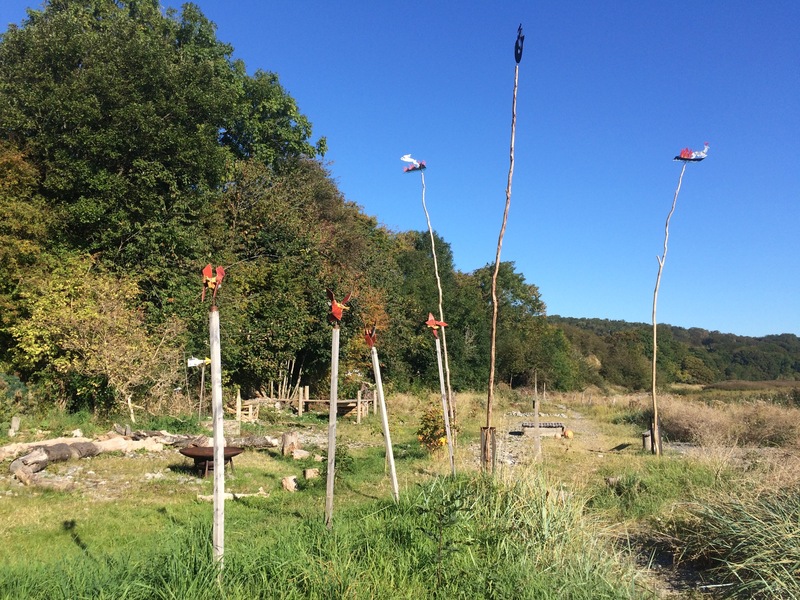 This is a great place to come and see migrating birds in the Autumn and there were several hundred Oystercatchers on the shore. 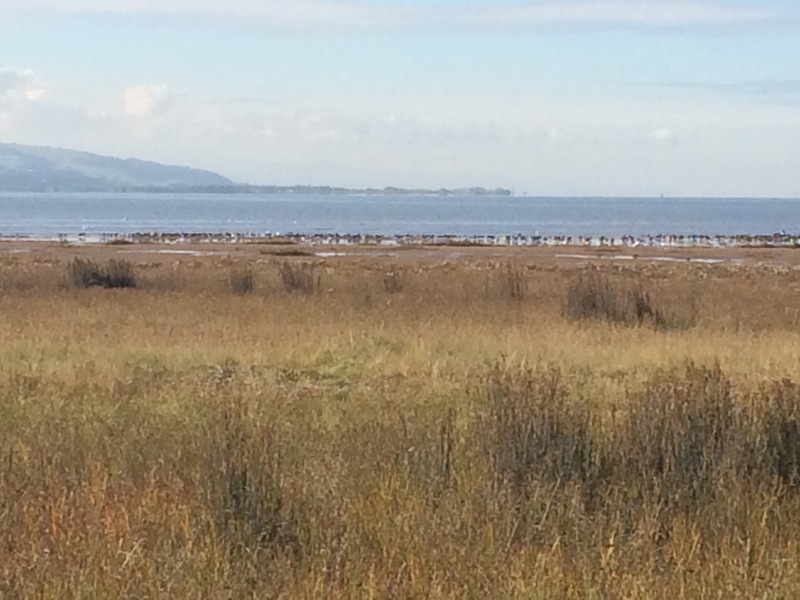 The sun came out and I had a lovely walk along the edge of the marshland bordering The Dee as far as West Kirby. 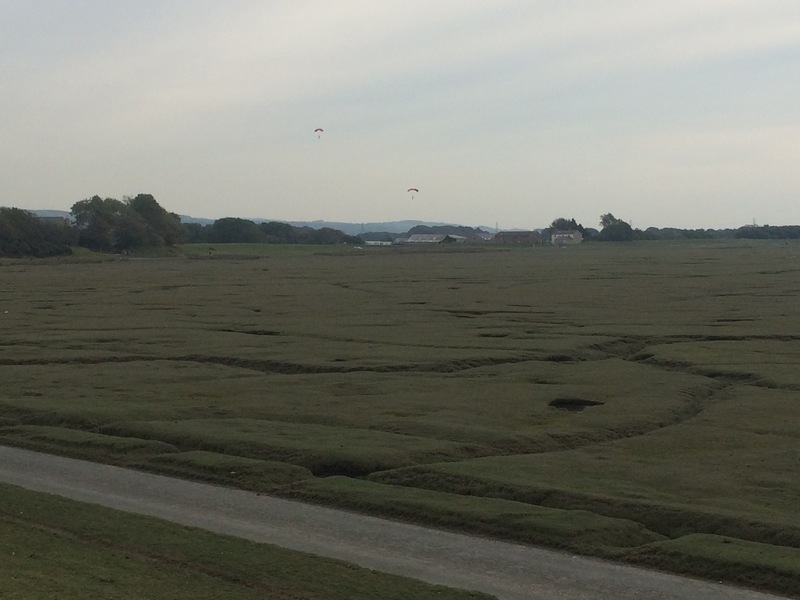 Here I was due to collect some more maps so I headed into the picturesque little town and missed walking around Marine Lake: a man-made salt water lake with quite a small border that separates it from the Dee estuary. West Kirby was quaint, busy and friendly. The lady in the Post Office was very friendly but, yet again, my maps had been sent away. I have lost all confidence in the Post Office as none of the staff I meet know the service they are supposed to provide and they agree things on the telephone that they later deny. Very frustrating. 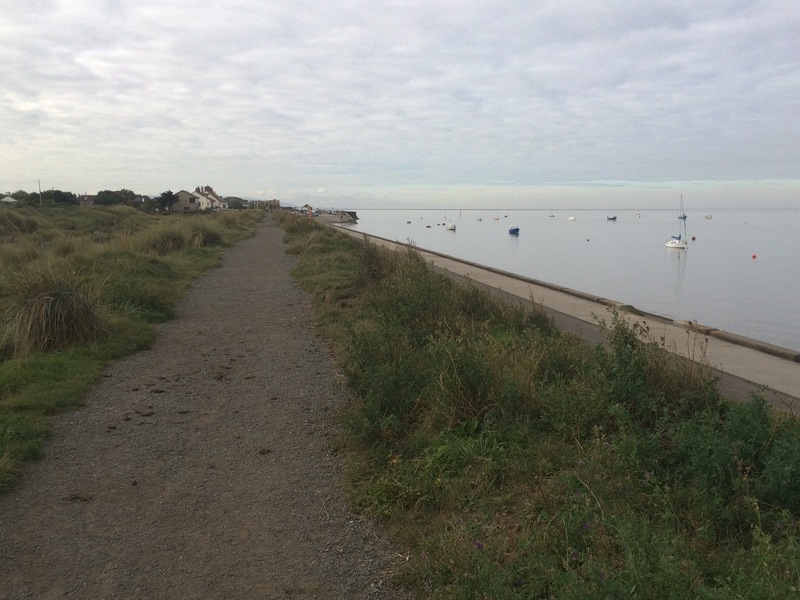 From West Kirby I picked up after Wirral Way, a path following an old railway line located in Britain’s first Country Park (designated in 1968). Much of this path is in the trees and the coastline is not visible, but it was a nice walk. 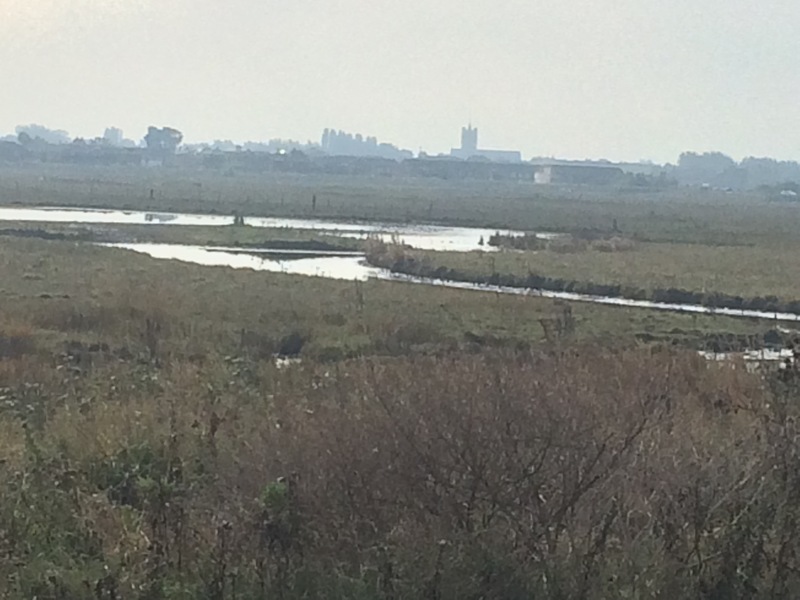 I did try walking a section along the shore but it was quite difficult walking on the edge of marsh through huge reeds so I abandoned that idea. 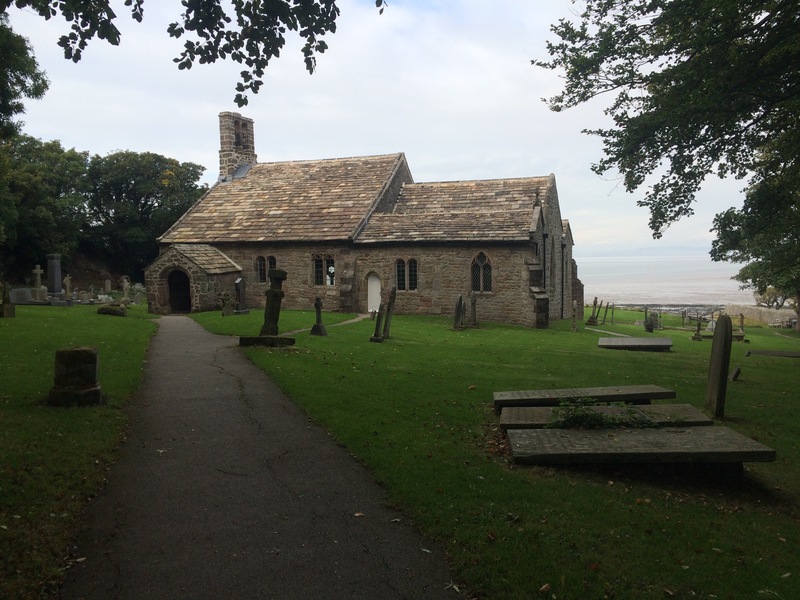 Neston is the last town on the Wirral coastline and here I met up with my Aunt and Uncle. 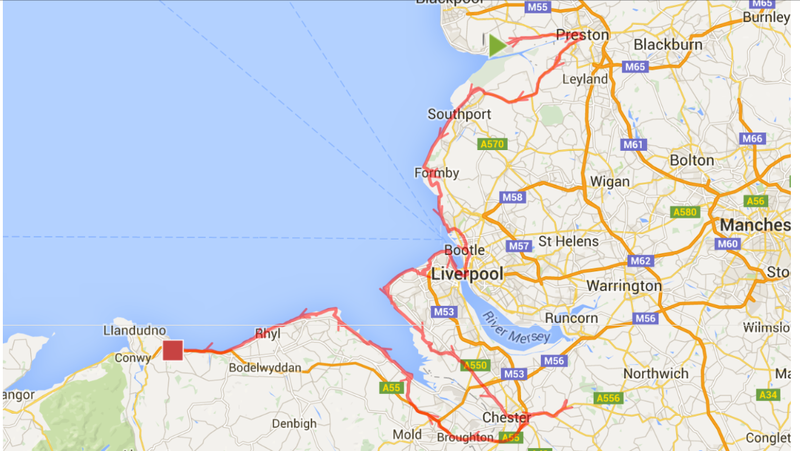 I had decided to finish my Wirral walk here and to avoid the road walk across the border into Wales. Luckily for me Esta and Alan offered to drive me into Wales tomorrow. 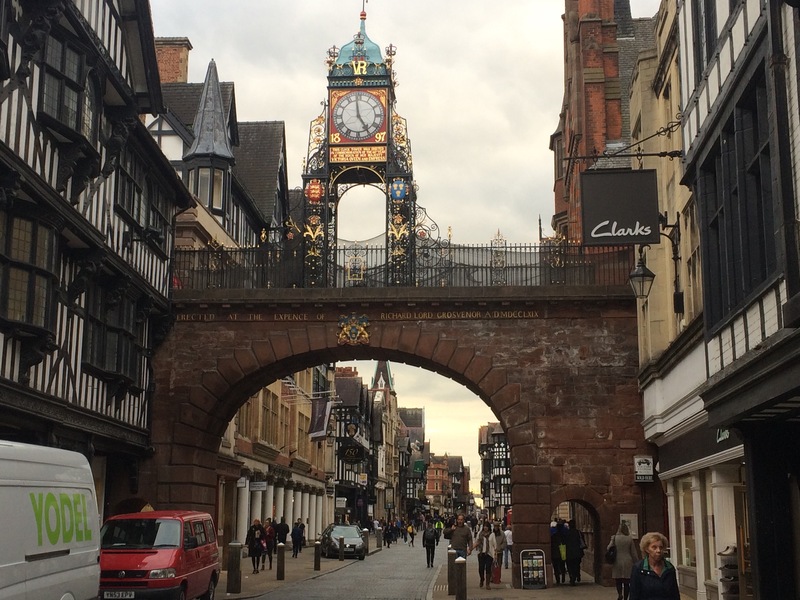 On the way back to their house they kindly diverted into Chester city centre so I could buy some more maps. This is getting rather expensive for the Post Office to keep refunding me for lost maps! 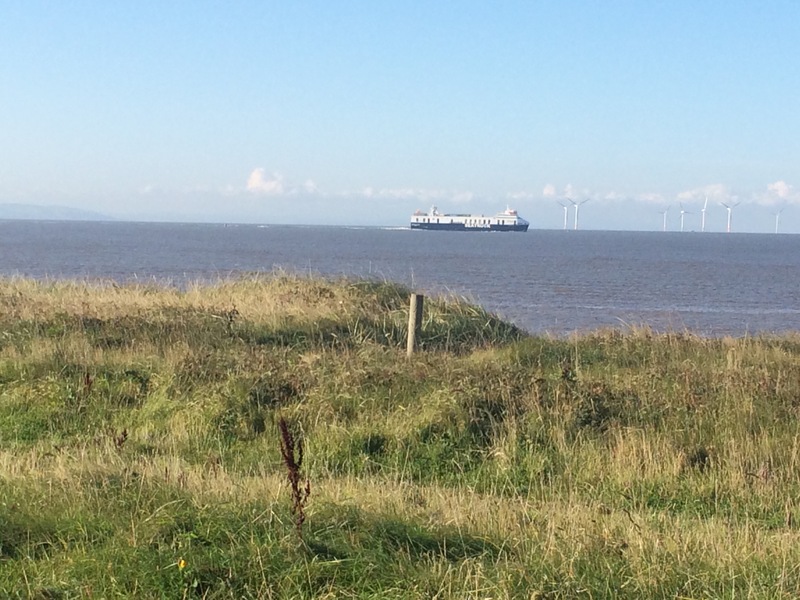 Kathrine’s house looks across the dunes at the Irish Sea and the busy shipping lane heading into Liverpool docks. The geese were on the move in the morning and I headed past the sailing club and onto the beach. 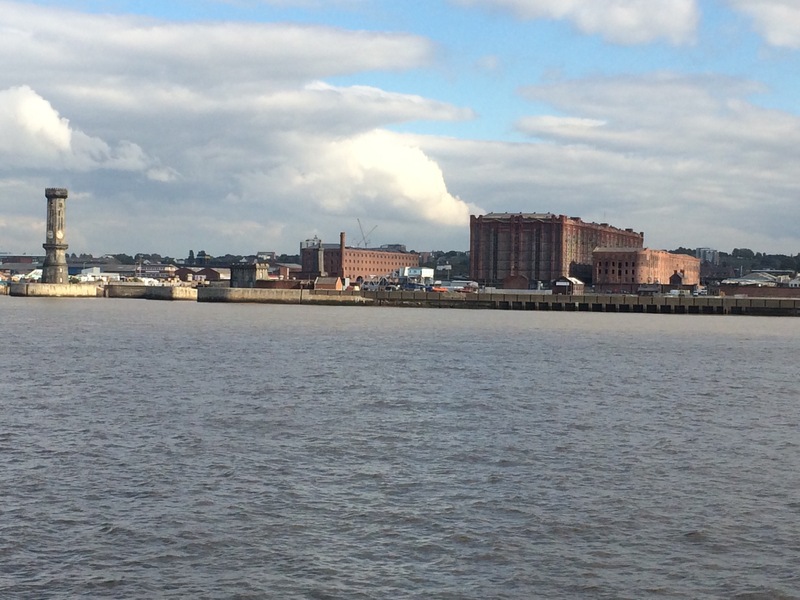 I had been advised only to walk as far as the docks and then to get the train from Waterloo into Liverpool. 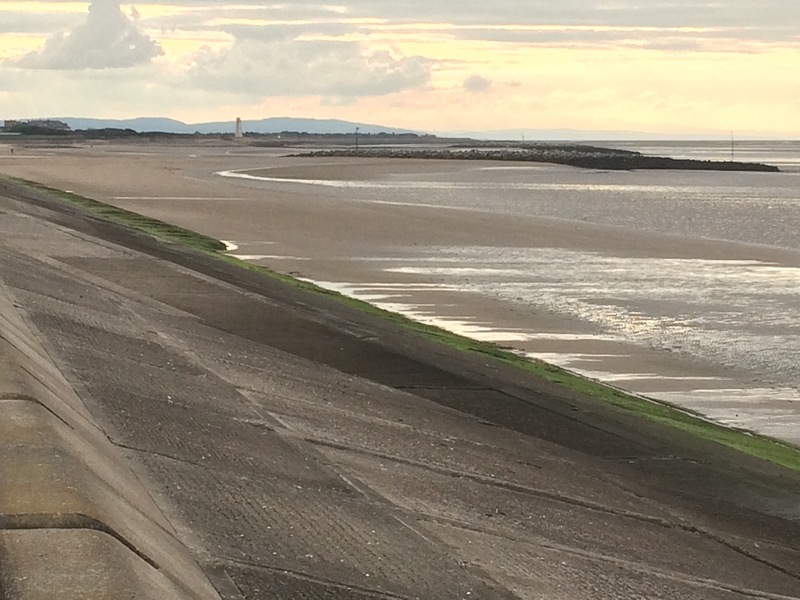 It was a lovely walk along the beach and the promenade, past Crosby. The Burbo wind farm was in the distance and huge ships kept passing. 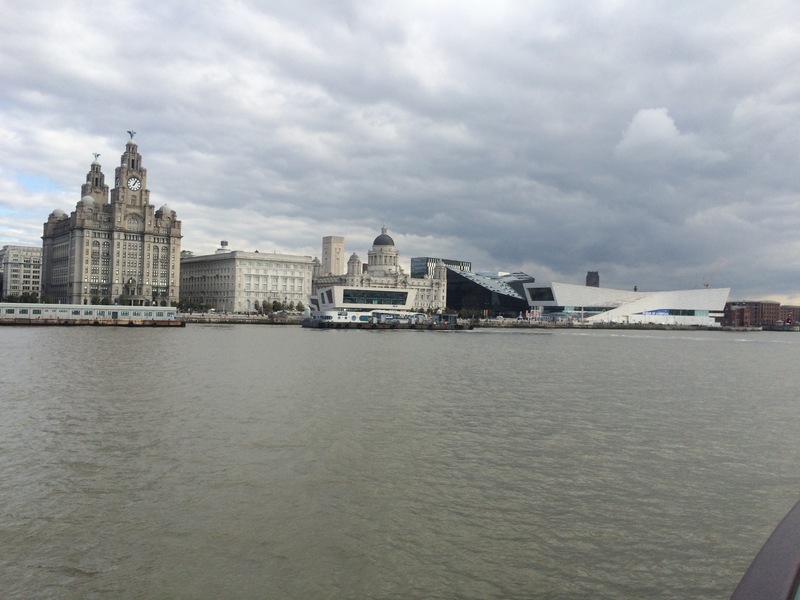 As I approached the docks it looked like there were people going for a swim in the sea. In fact they looked like they were heading determinedly into the water as if they were going to swim to Wales (or else to drown themselves). 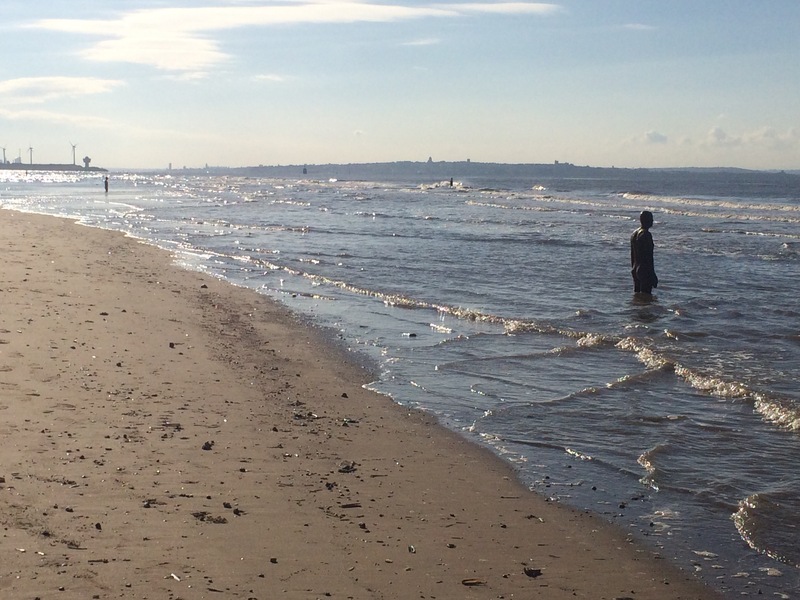 These are The Iron Men: Anthony Gormley’s sculpture, Another Place. 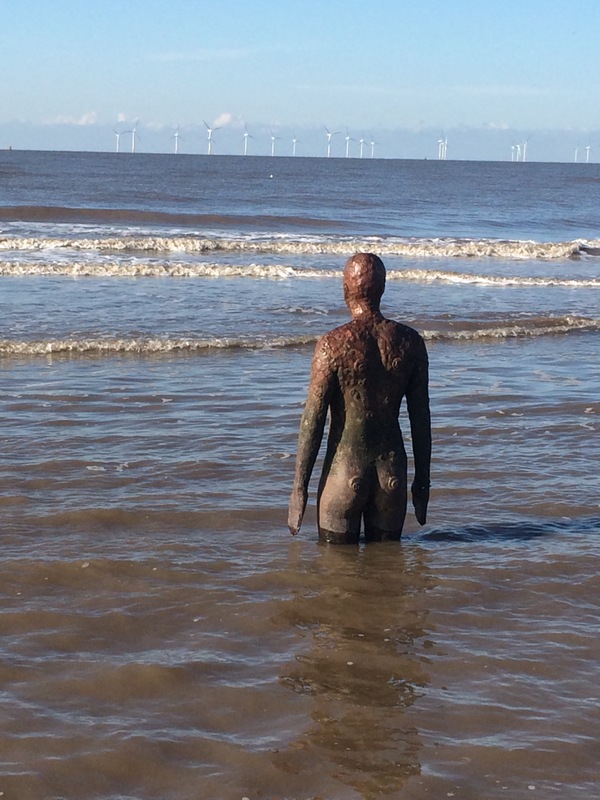 There are 100 iron figures on the beach and they are quite an attraction; lots of people were out looking at them. 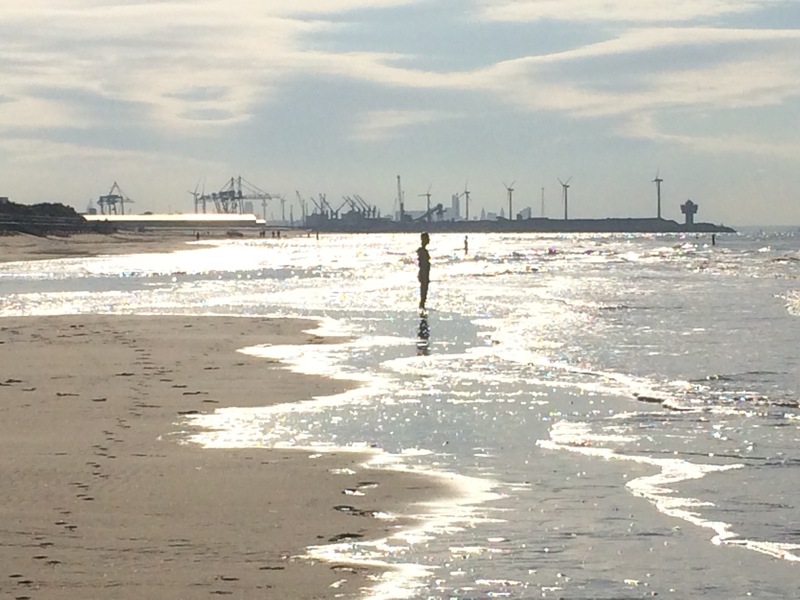 I left the beach, walked to Waterloo train station and caught the train through Bootle to the centre of Liverpool. 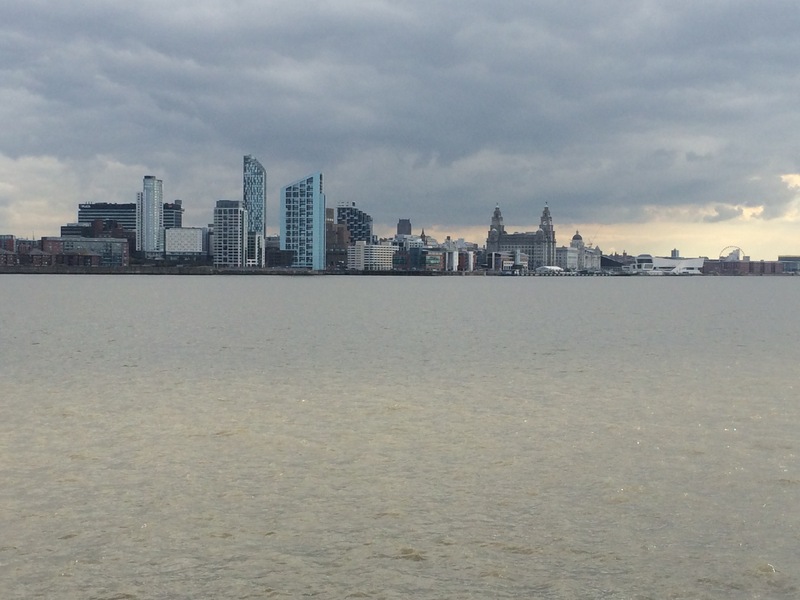 I could have stayed on the train and gone to Wallasey, but why would I do that when I could get the famous ferry across The Mersey? 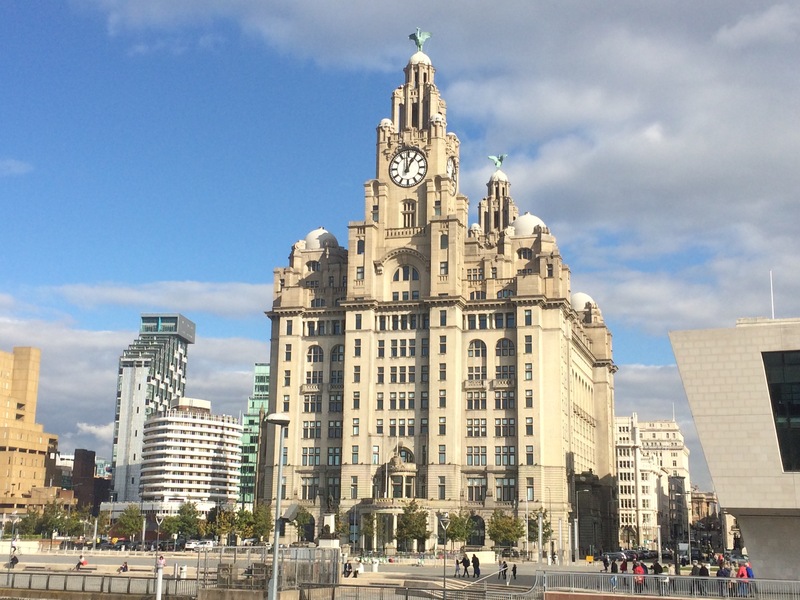 Walking down to the ferry port I saw the beautiful part of the city with its talk, elegant buildings like the Cunard Building and the Liver Building. I was just in time to catch the Dazzle Ferry. 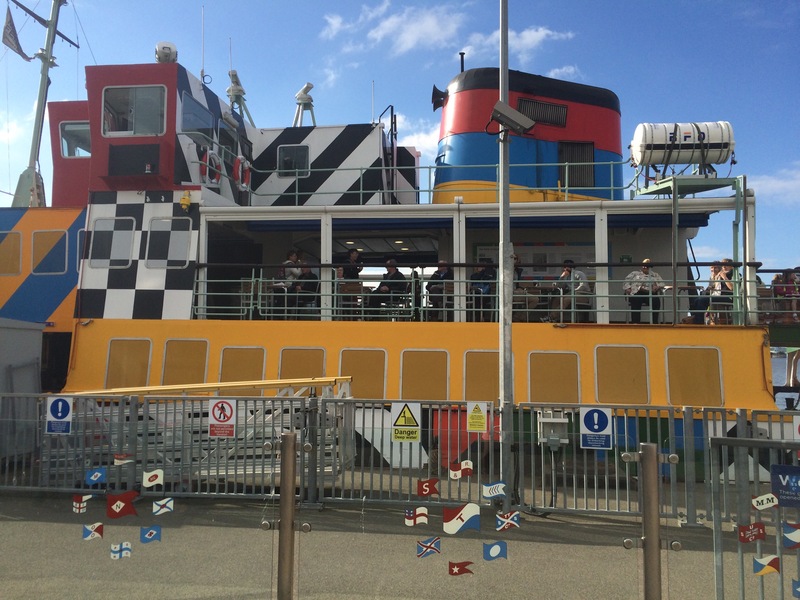 The regular Mersey ferry had been painted in dazzling colours and patterns in honour of the WW2 dazzle patterns. 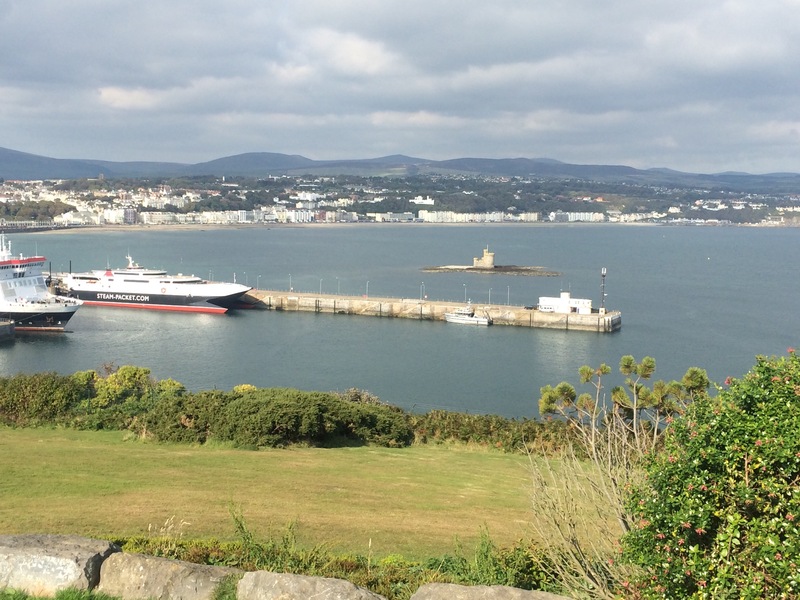 Can you spot the ‘dazzle’ ferry? 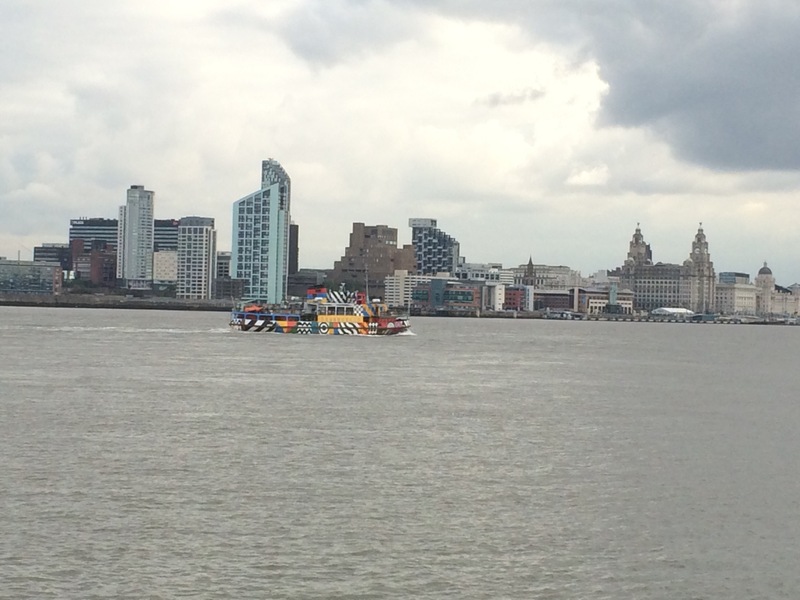 The ferry was packed with tourists and it gives a guided tour of Liverpool and Wallasey landmarks (after playing the first few bars of its own song). 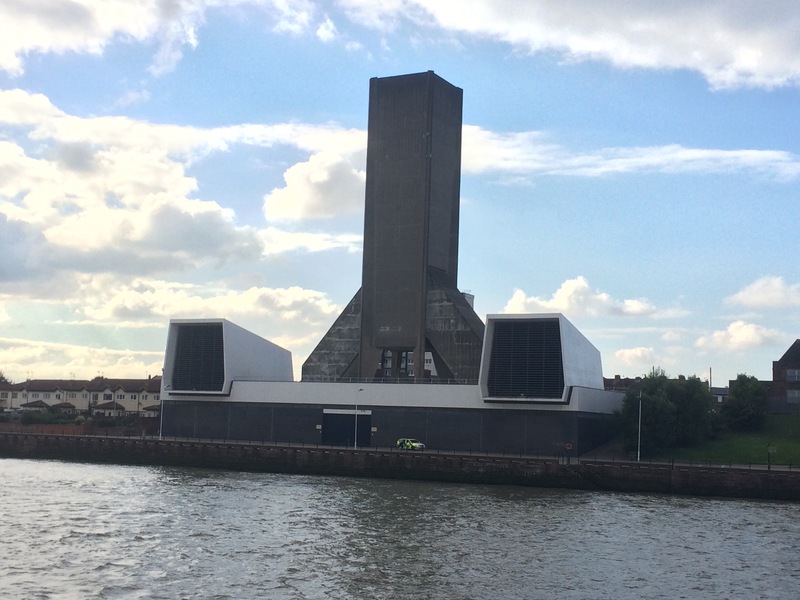 We docked at Seacombe and I stopped for a coffee before walking alongside the river to New Brighton, the right hand tip of the Wirral. 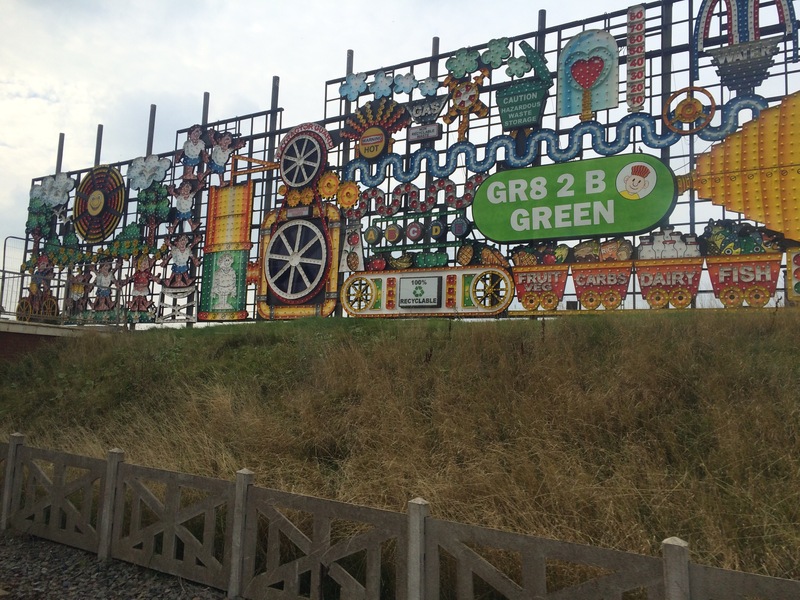 The walk was signposted with bits of art and things to look at. 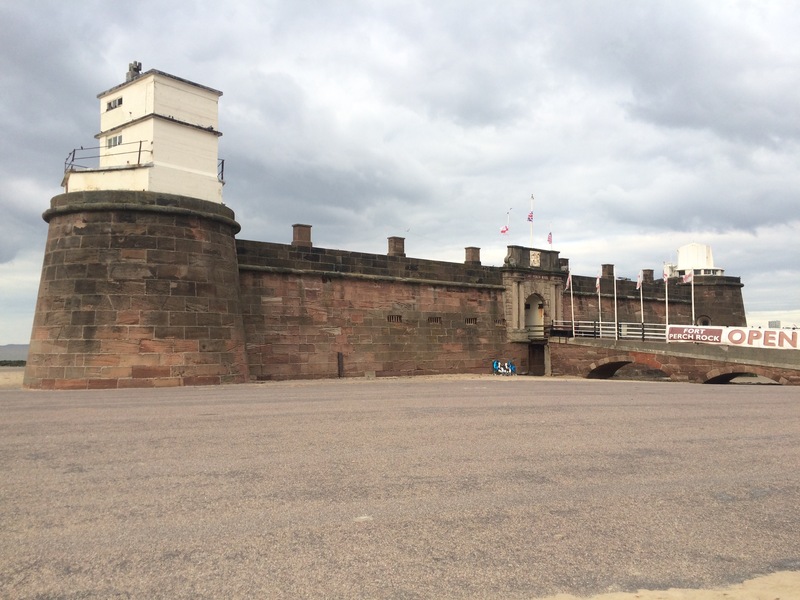 New Brighton was once a bustling holiday resort but I didn’t stop for candy floss or a tour of Fort Perch Rock, the small fort built to help repeal a possible Napoleonic invasion. 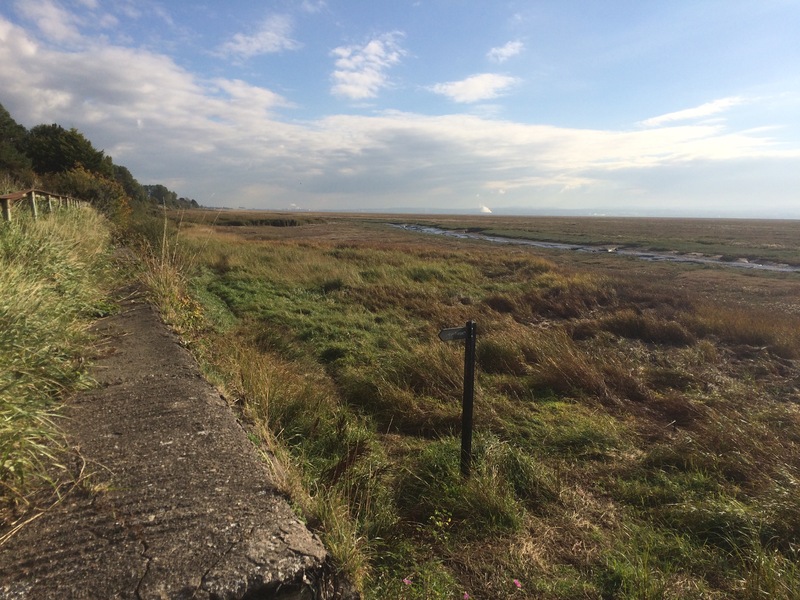 I rounded the corner of the River Mersey and headed halfway along the Wirral coastline as far as Leasowe train station. The coastline was rather barren on a grey afternoon, looking at grey water and with grey buildings behind the grey concrete path around the edge. 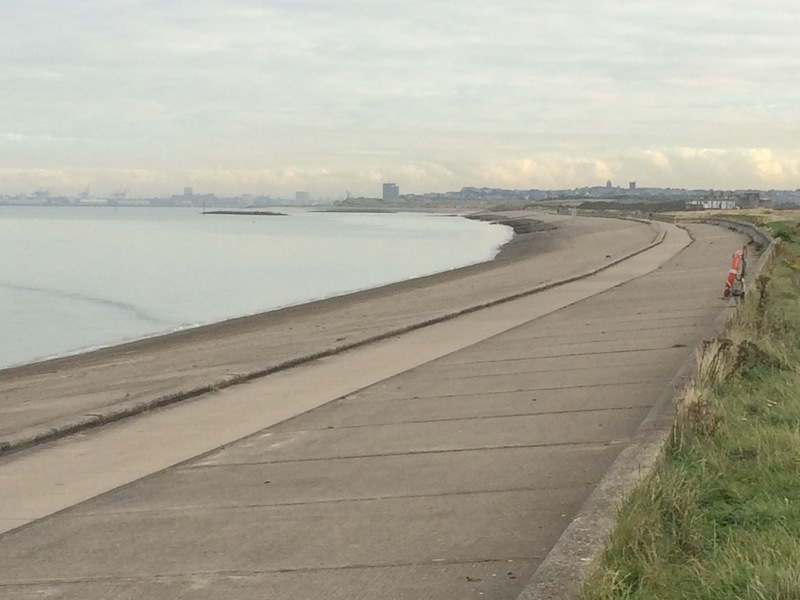 At least Wirral has a designated Wirral Circular Trail that is a 37 mile long circumferential path taking inthe 3 sides of the peninsula and heading across-country to join them up. 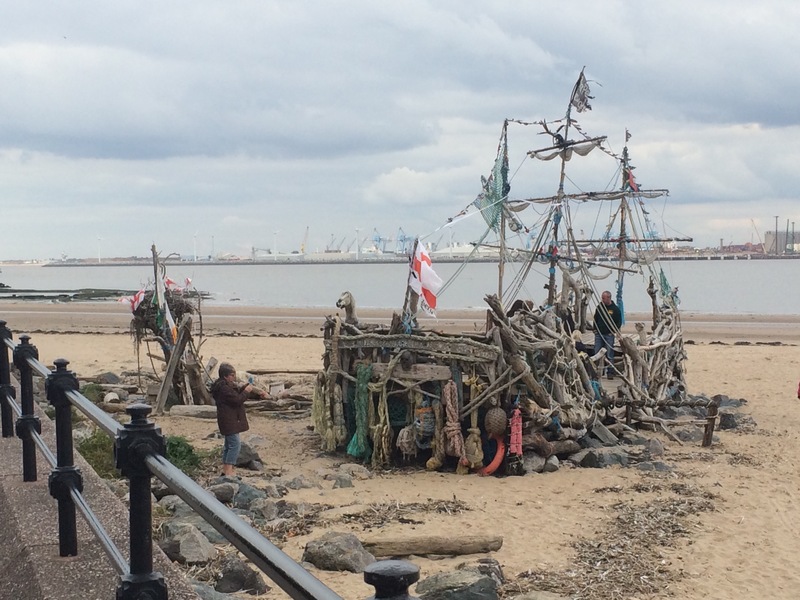 My walk through Leasowe showed me one of the less affluent parts of the Wirral; no hint of seaside living here. I caught the train back under The Mersey to Liverpool and then on to Runcorn to meet up with Ivor. I’d promised to visit Ivor on my way and he very kindly offered to put me up for the night, even though he’s just turned 90. We went out for a lovely dinner with his son and grandson and their wives. It was very cold last night and I didn’t manage much sleep. My sleeping bag was damp and the tent was soaked. I was keen to get out of the horrible campsite so I was away as quickly as possible and caught a bus into Preston to avoid walking the main road. I didn’t see much of Preston but I did make my way out of the bus station and into a shopping precinct to get a coffee in between buses. I had decided I would not bother walking the mixture of roads and paths along the River Ribble as it didn’t look that exciting and I wanted to reach Hightown. So I caught a bus to Crossens, the first town in the borough of Sefton. I had reached Merseyside. 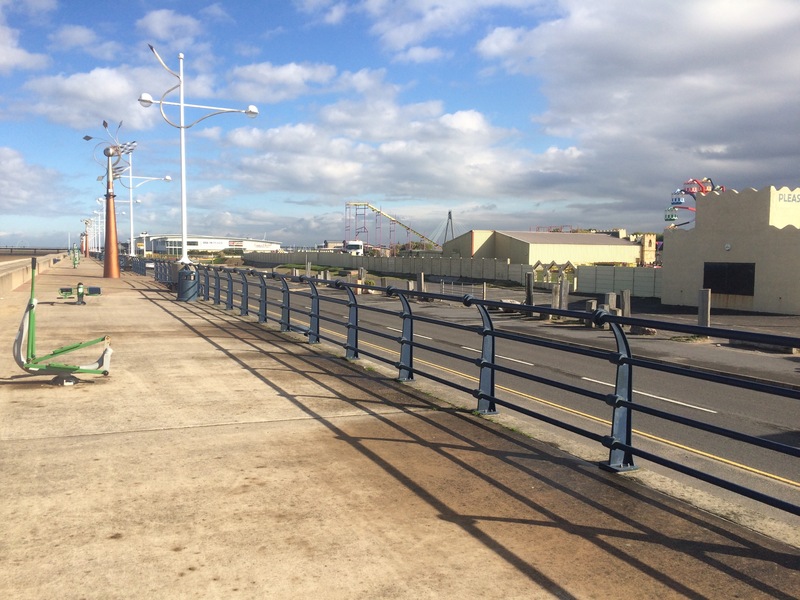 I walked around the corner of the River Ribble, so I could look back across at Blackpool, and then I was on Marine Drive, the coast road to Southport. The road must be built on sand because it’s quite bumpy. The sky was getting very dark and it looked rain but fortunately I escaped and the wind blew the cloud inland before it dumped its contents on someone else. 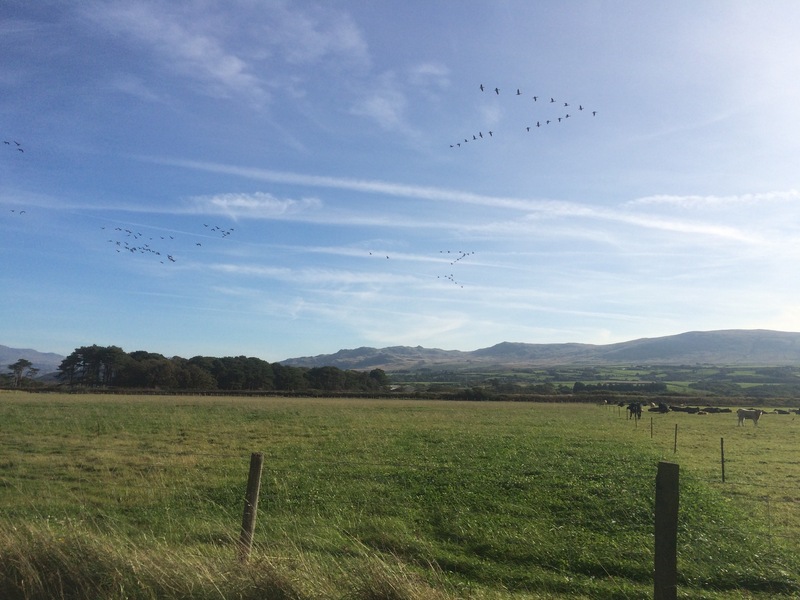 The Marshside RSPB Nature Reserve is situated on the corner between the Ribble and the Irish Sea, and there were several birders out today. 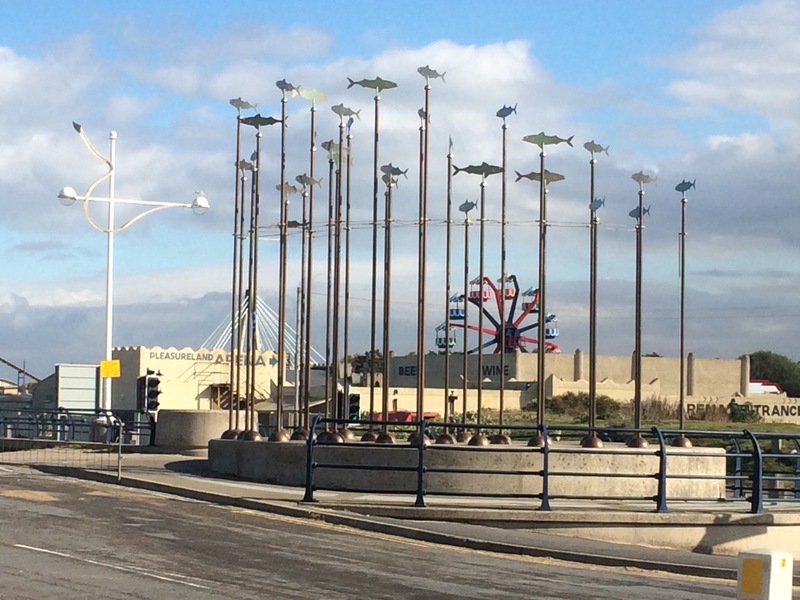 Southport is set back from the sea and its buildings look quite grand from a distance; a contrast to the funfairs and garishness of the sea front. 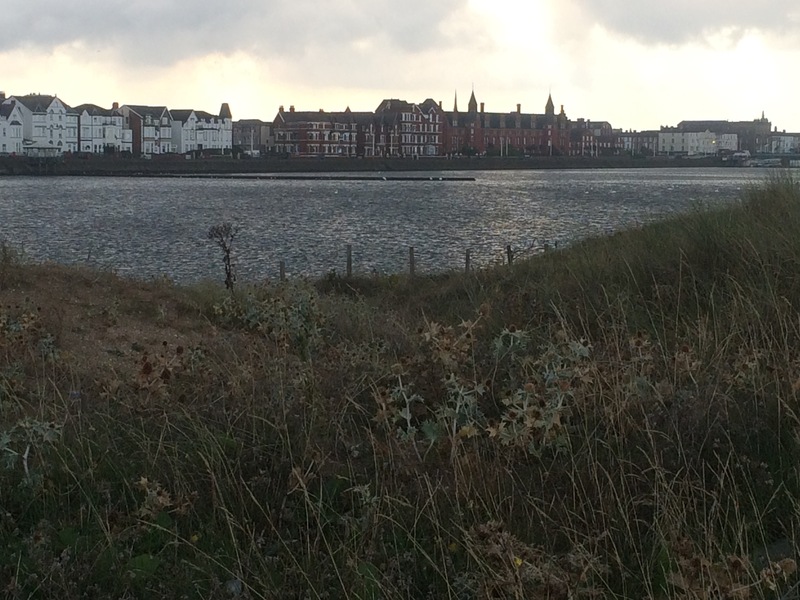 I walked past Southport on the promenade and then diverted onto a footpath through the dunes. The sun came out and I had a lovely, peaceful walk hidden from everything except the sound of the sea. 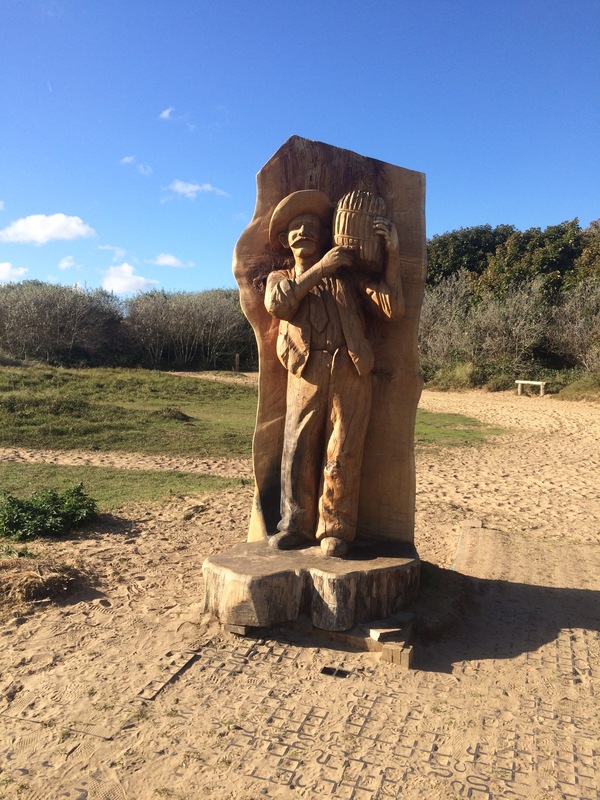 After about an hour I popped out onto the beach and walked the rest of the way to Formby along the beach. 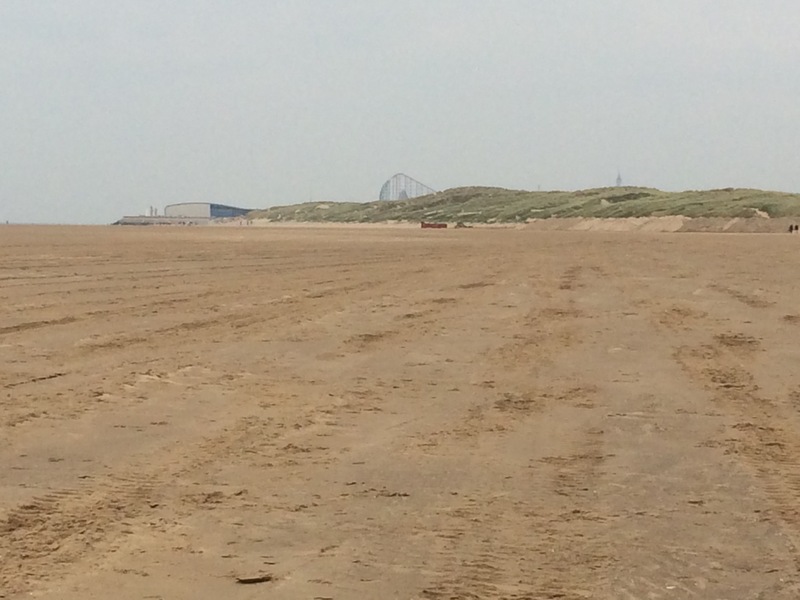 The sand is beautifully fine (which makes it hard to walk) and the dunes are big; it reminded me of Aberdeen’s beach. I reached Formby and diverted off the beach here in the hope of seeing a red squirrel in the reserve. It wasn’t my lucky day but the Asparagus Walk through the Jubilee Wood pine trees was lovely nonetheless. 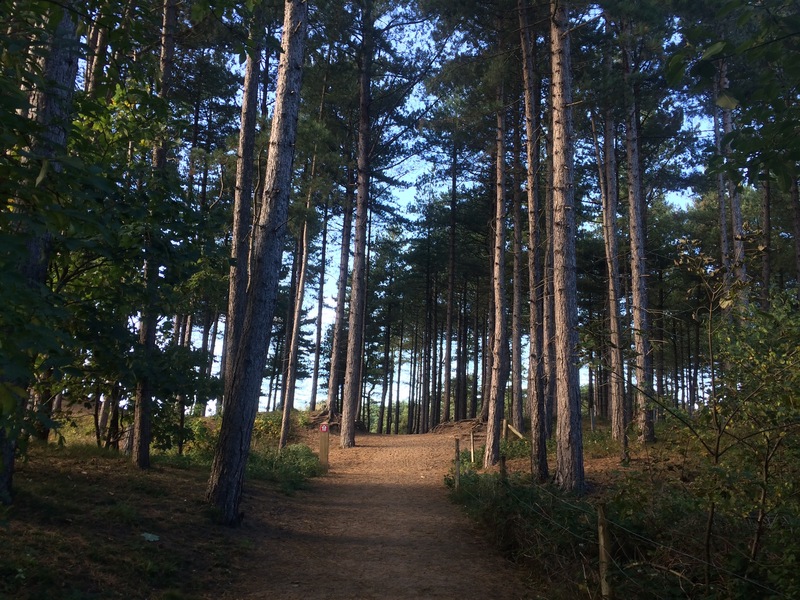 This part of Formby used to have big asparagus farms. I used to play hockey here in Formby and I had forgotten just what a lovely town it is. It really is a gem on this coastline. 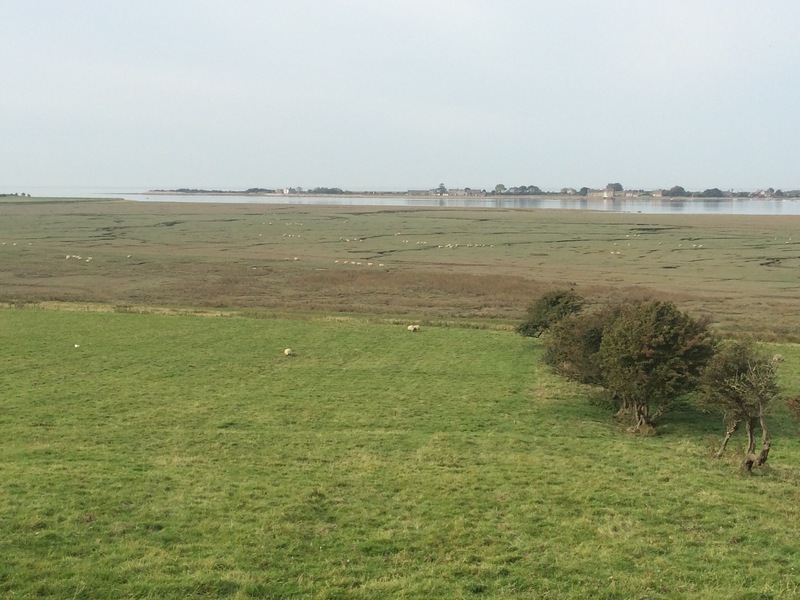 The coast path diverted inland alongside the railway line in order to skirt around the Altcar Army Range. I arrived at Hightown and Kathrine met me. Tina Cullen came round for tea and I had a great evening catching up with old friends, 17 years after I left the hockey club here. A fantastic week in the Isle of Man, followed by a walk through the boroughs of Wyre and Fylde, and of course there was Blackpool. I think I might have done my last camping next of the year as Sunday night was very cold and the morning dampness of everything is turning into sopping-wetness. 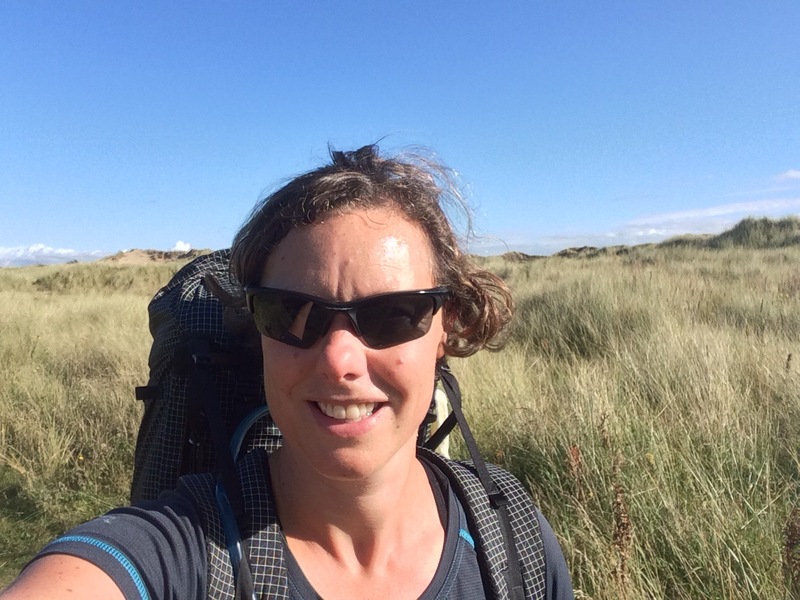 I’ve really enjoyed the ease of camping in my lightweight tent and finding B&Bs/hostels for every night has the potential to become time consuming as well as expensive. I have to mention the geese. There are thousands of them on this NW coast and they are fabulous. In the morning and the evening there are huge gathering flocks, all flying in formation and making lots of noise as they go. A very impressive sight. It had been a mild night and the morning got off to a good start when Jimmy and Lesley invited me into their caravan for tea and a croissant before I set off. I spent 40 minutes chatting to them before heading off to get the Wyre Rose Ferry. 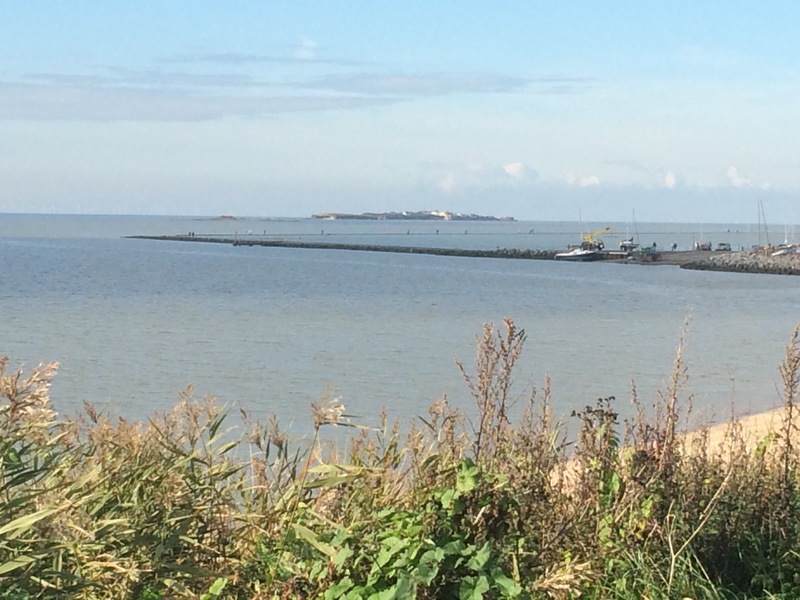 Although divided by the River Wyre, there appears to be a strong connection between Knott End and Fleetwood, probably linked by their fishing history. 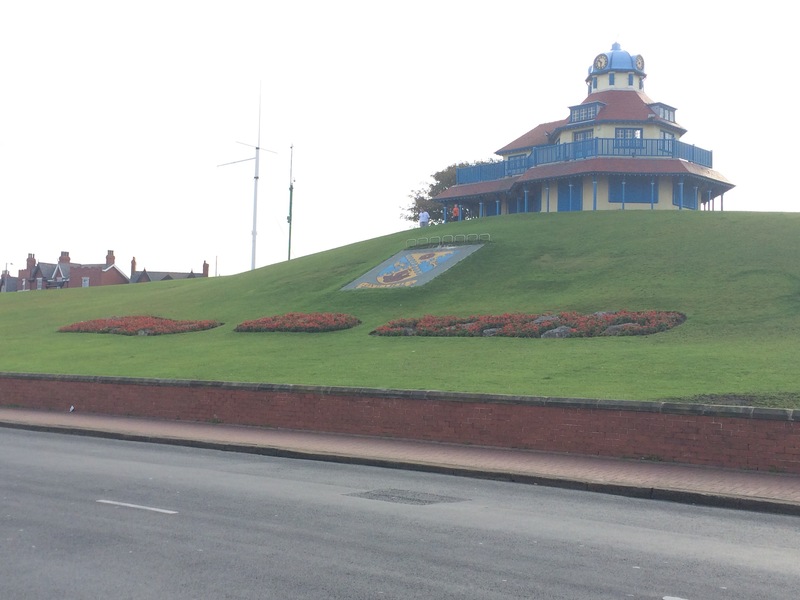 The Victorian town of Fleetwood was finance by Sir Peter Hesketh in 1835 and the layout was well-designed for a seaside resort. Some of the buildings designed by the noted Victorian architect, Decimus Burton, still remain, as do the parks. 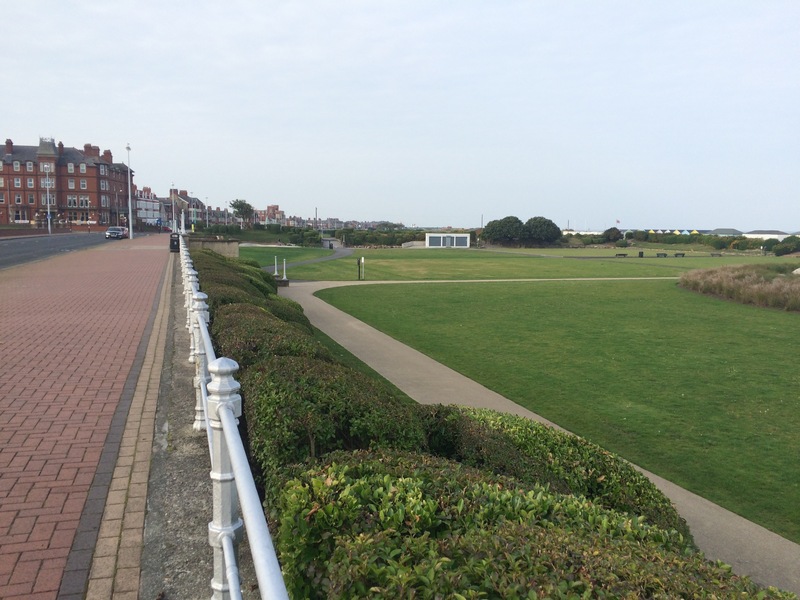 Reassuringly British resort names such as The Esplanade and Marine Gardens abound. The town has the air of a once-renowned resort. Upon leaving Fleetwood the scenery changed. From here onwards I felt like I was walking my way through the British class system. Apart from Rossall School, which has rather a grand old building in the middle of a large estate, Rossall itself was very rundown. 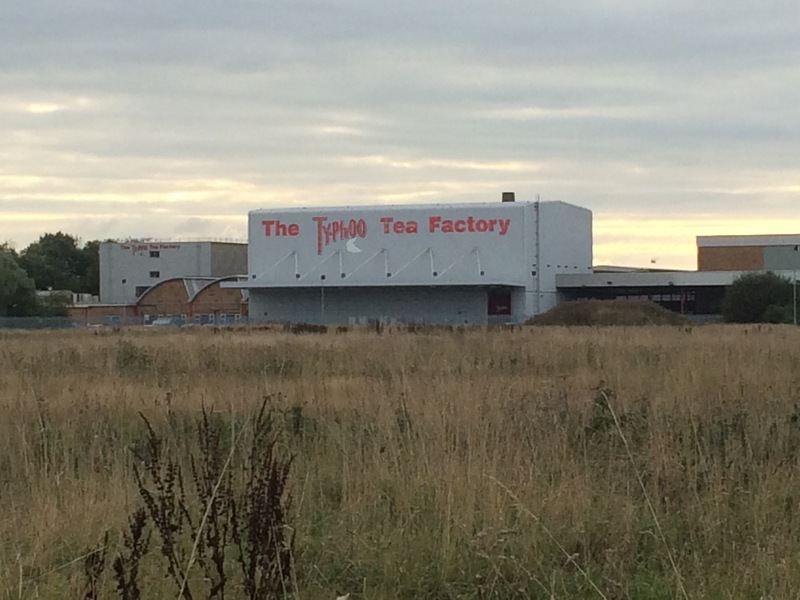 It reminded me of Jaywick, the Essex ‘benefits’ town. 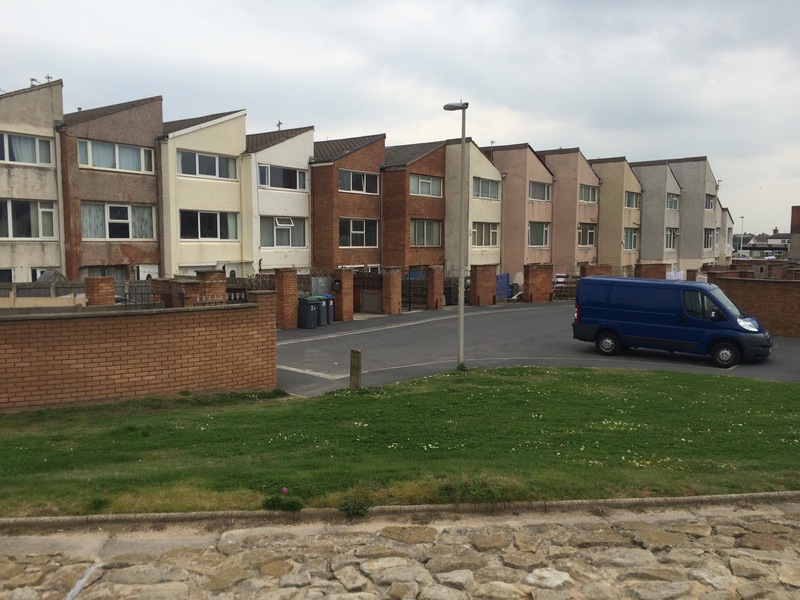 Cleveleys was not that much better; although the facade and design of the apartment blocks was steadily improving. 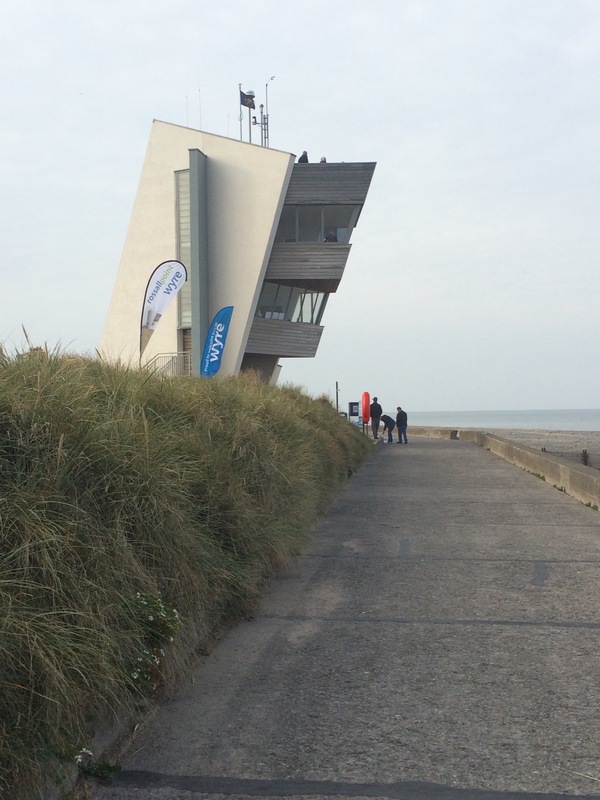 In contrast to the down-at-heel look of the accommodation, money had been spent on the Cleveleys sea front. 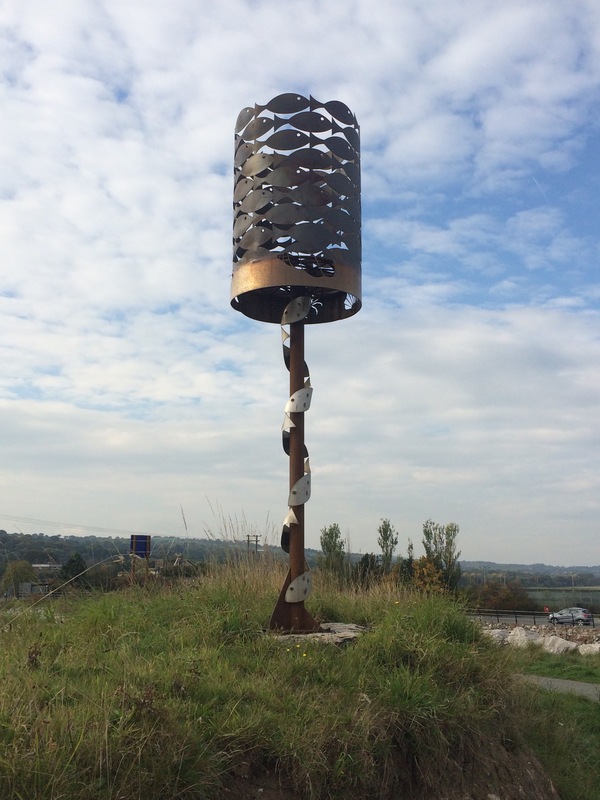 The Tarmac was new, there were sculptures and weird-looking lampposts. It was a complete contrast to most of the houses and flats just across the street. 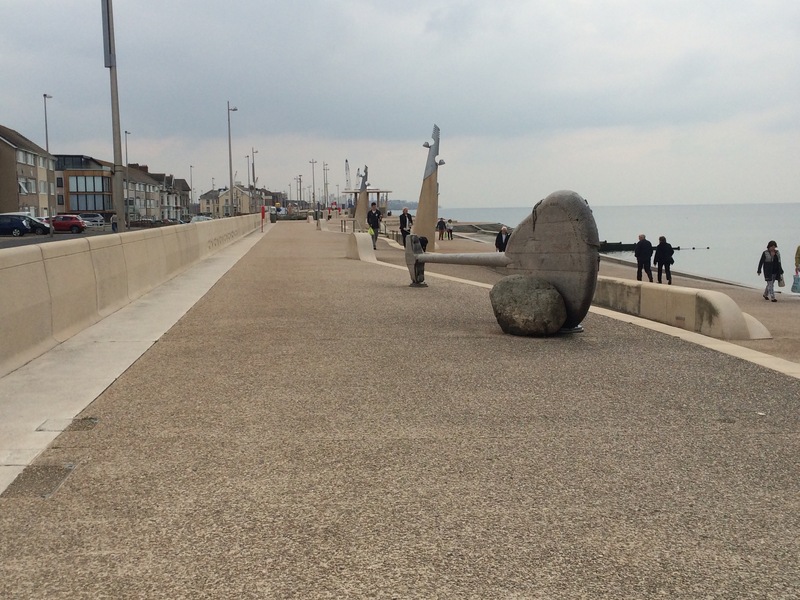 A notice told me that £1.5M was being spent enhancing the sea front. 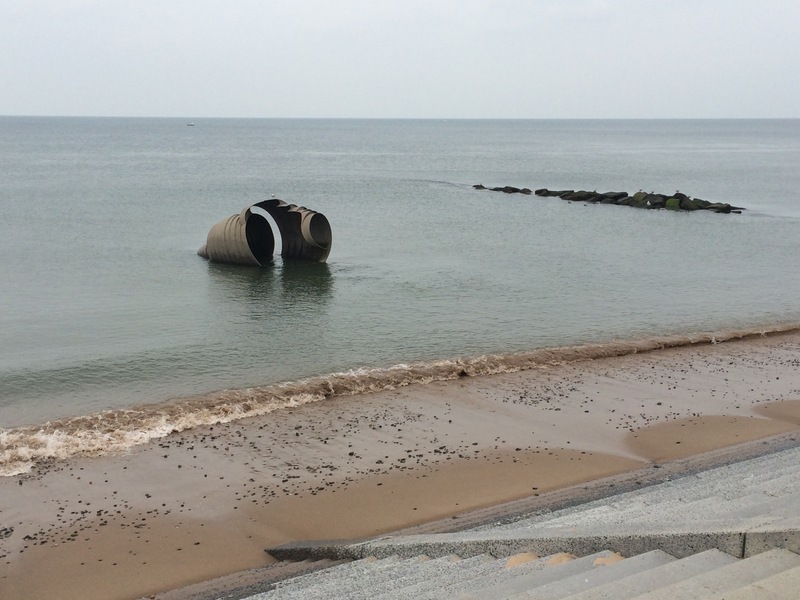 This is in conjunction with £85M being spent on improving the sea defences at Rossall and Anchorsholme. I had been following the promenade most of the way but was forced to leave the sea front just after passing the rather splendid coastguard lookout tower. 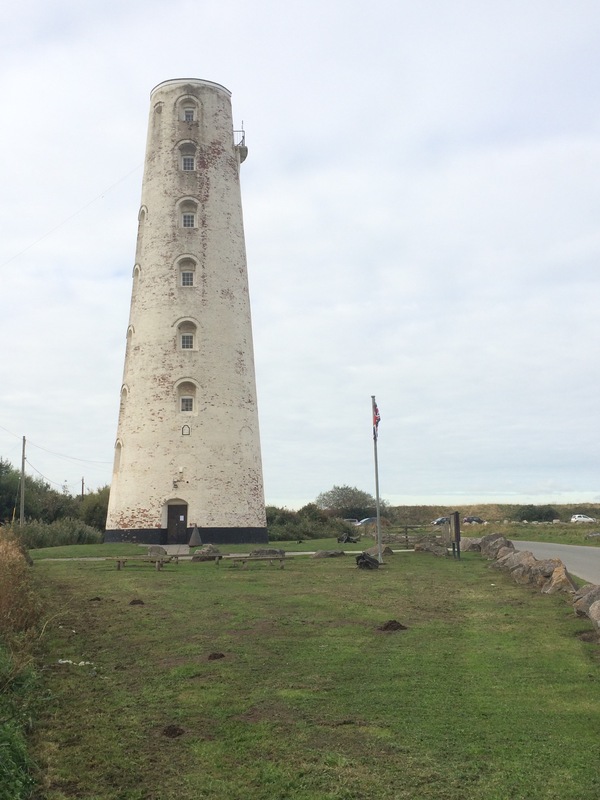 There were local volunteers there watching birds and collecting litter, and the tower was open to the public. I didn’t bother going in because it was a dull day so not much was visible. 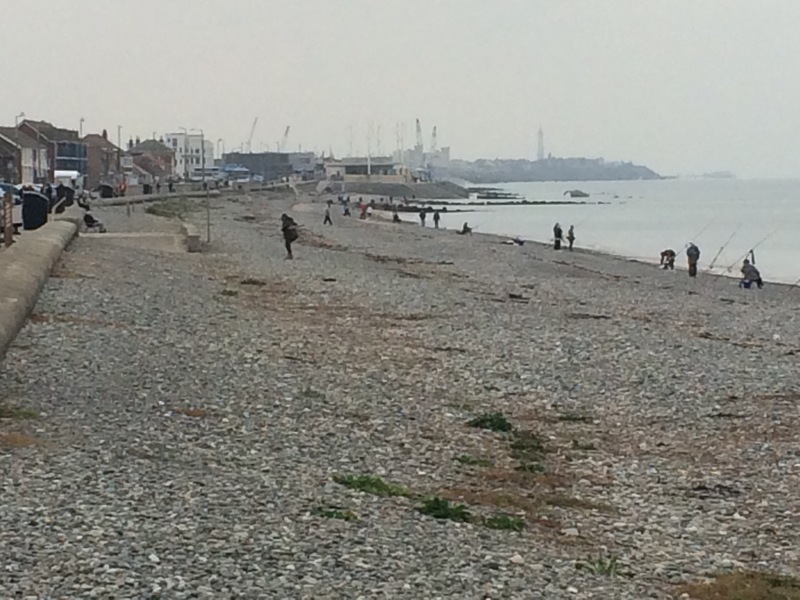 The sea front was closed due to the work to improve the defences and I was forced onto the main road at Anchorsholme. 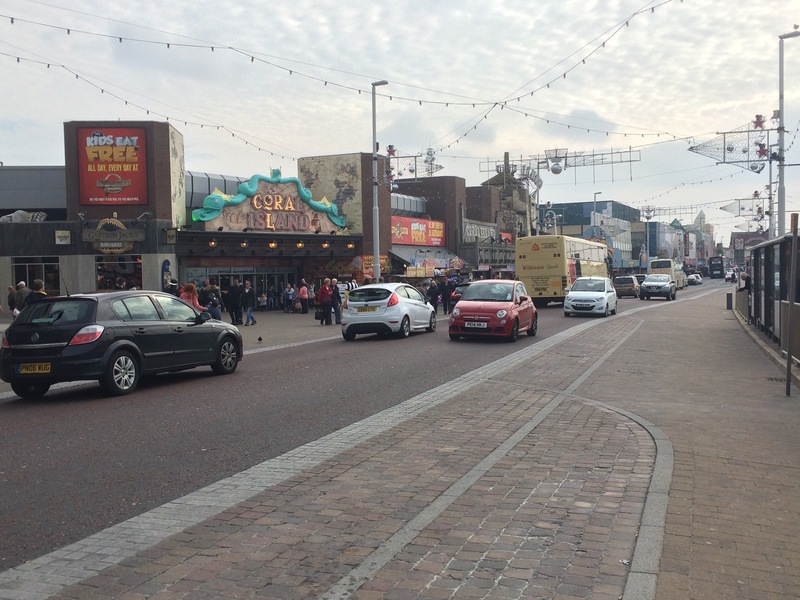 I jumped on a tram to take me along the front to Blackpool Tower. 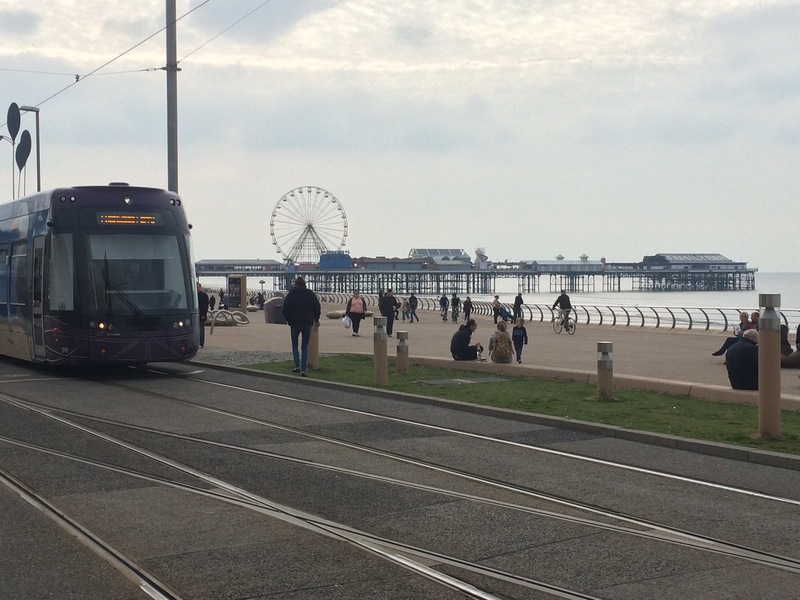 The trams are very convenient and cover 11 miles of the coastline, from Fleetwood to the Southern tip of Blackpool. 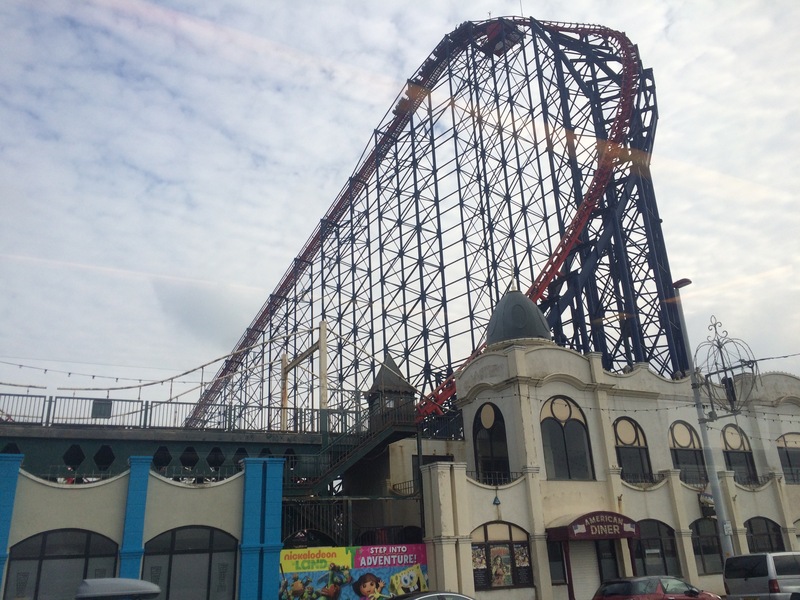 Blackpool; an assault on my senses even from the tram. It was teaming with people. To begin with every house on the front was either a guest house or a hotel. Then came the attractions – there was stuff to look at everywhere. I don’t even know what most of it was but it was all big and colourful and the people were loud. I alighted the tram at The Tower and made my way back a street to the shops (I needed to buy another map). There were street entertainers and sellers everywhere. I thought placing the 99p shop directly opposite the Pound shop was genius – I know which one my mother would shop at! This place is not short on things to see and do! 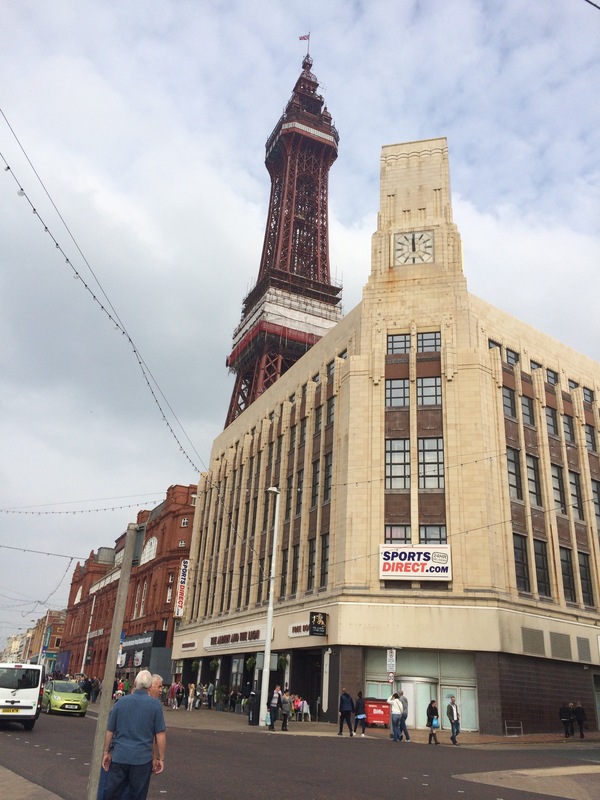 I thought I might go up the Blackpool Tower, but at £35 for the privilege I decided not to. Instead I got back on the tram and headed to the terminus at Starr Gate. Blackpool had made me smile. 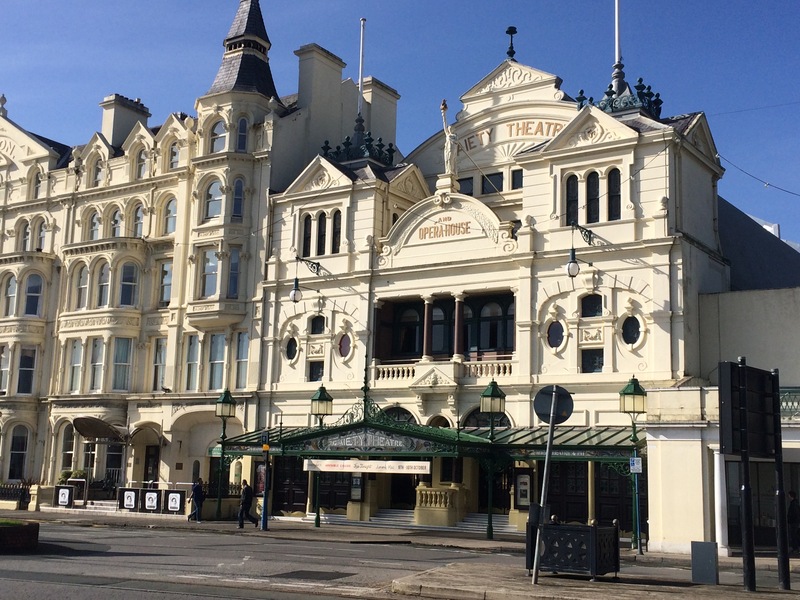 It is definitely the King of the seaside resorts. 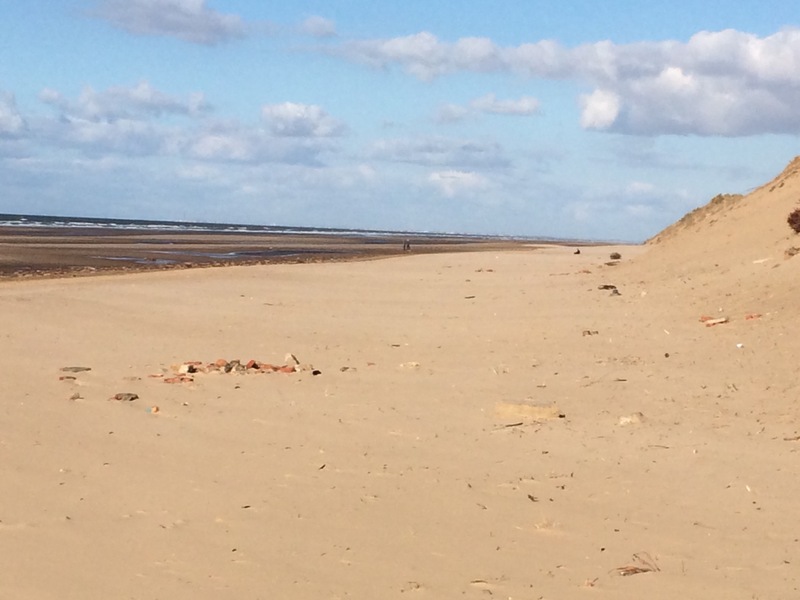 The tide was going out and from Blackpool to St Annes is a big sandy beach protected from the road behind by large dunes. It was nice to give my feet a rest from the concrete. Yet more people! This time they all had husky-type dogs with leads tied around their waists. 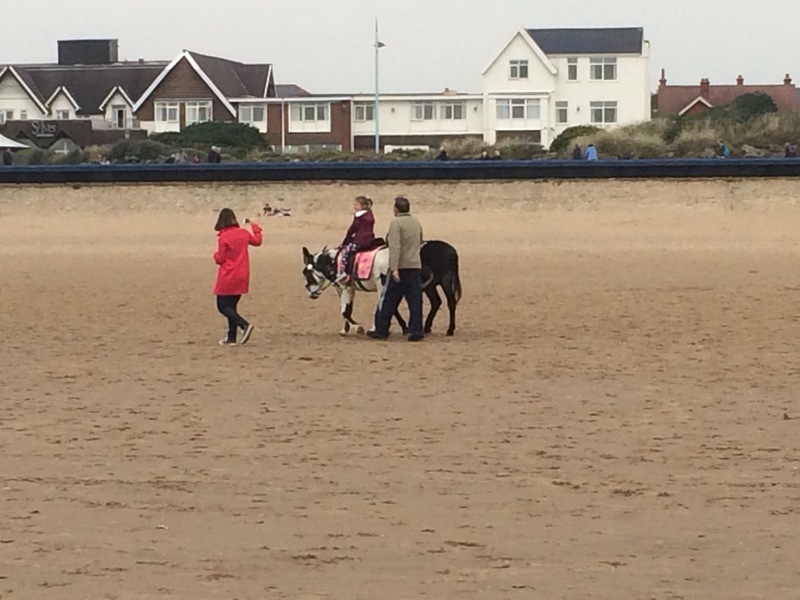 There were also families out on the beach and I saw kids taking donkey rides. St Annes looked more upmarket, although it does have a rather dilapidated-looking pier. The houses and flats were getting bigger and better-looking. 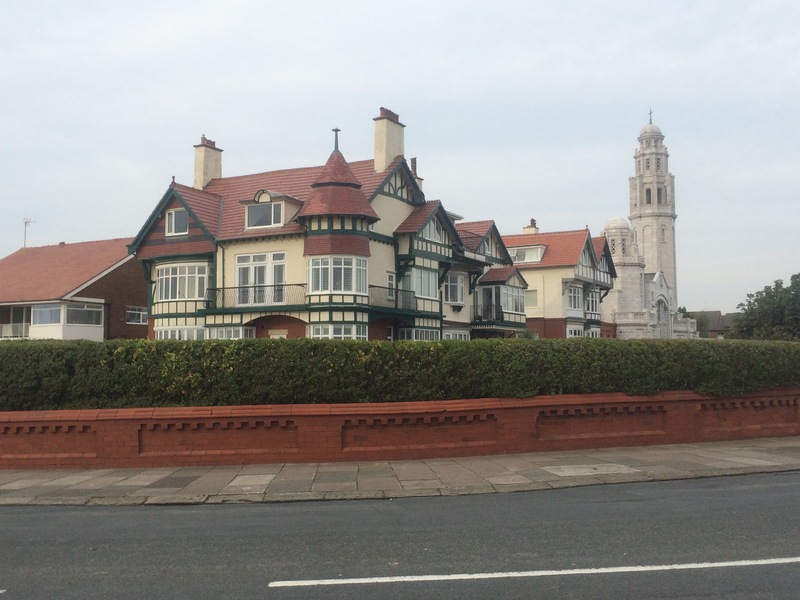 The beach ended as I rounded the corner into the Ribble estuary and I walked along the road admiring the buildings. 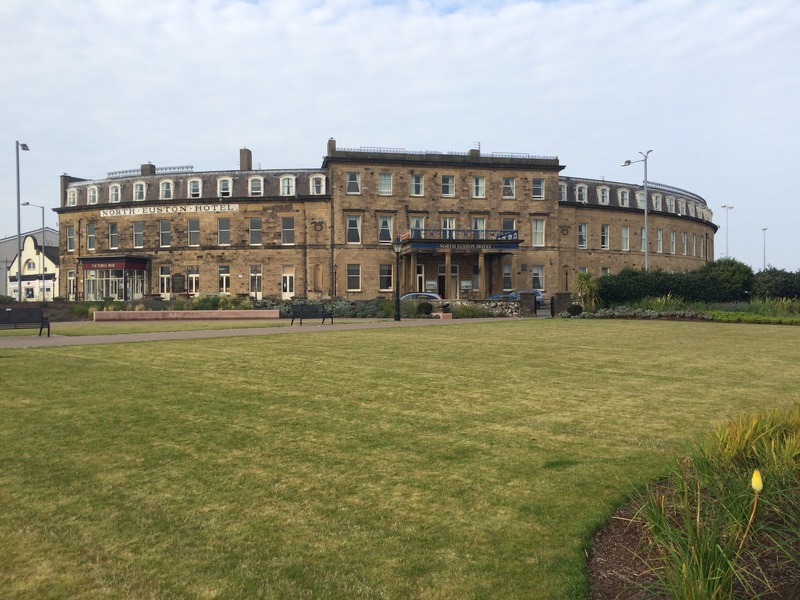 I walked past another large, rather posh-looking school and then came to Fairhaven Lake. Here there was a Spitfire MkVb mounted on a pole. 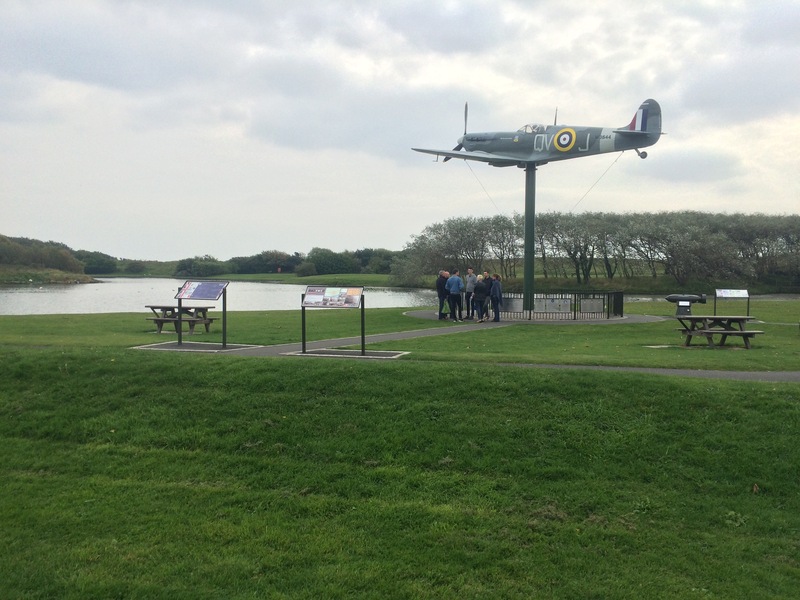 It was a replica of Lytham St Anne’s Spitfire, bought by the town’s community when they raised £6,500 in 1940 to help the war effort. 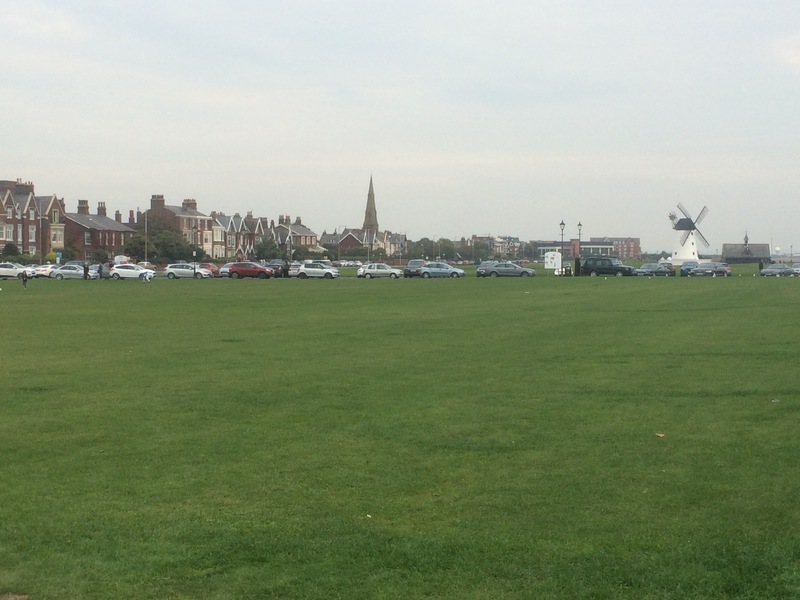 Lytham was the final, and looked to be the richest, town of the day. 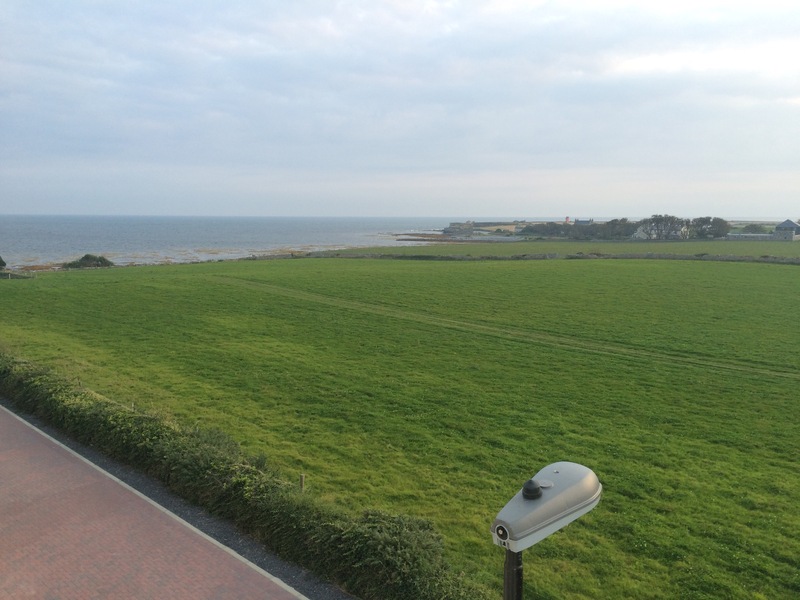 The large, detached houses overlooked lovely grassy areas in front of the sea defences. 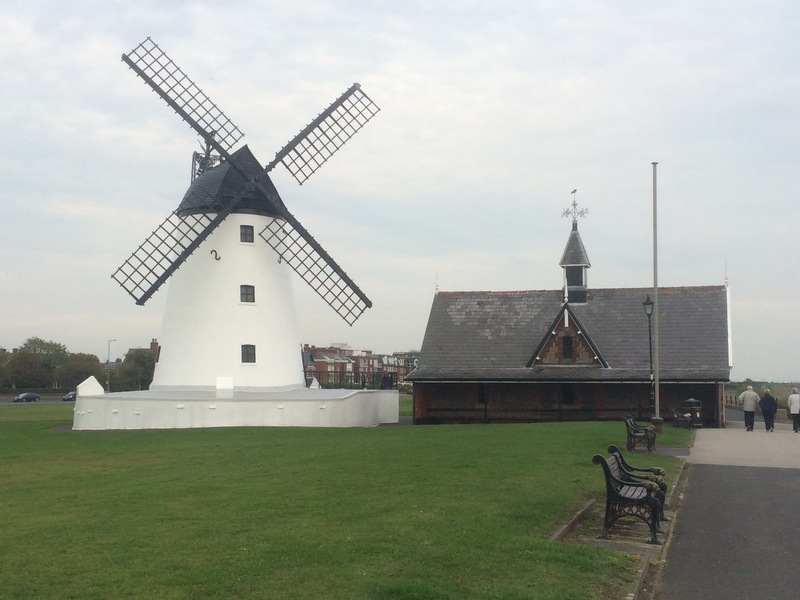 It even had a beautiful windmill. 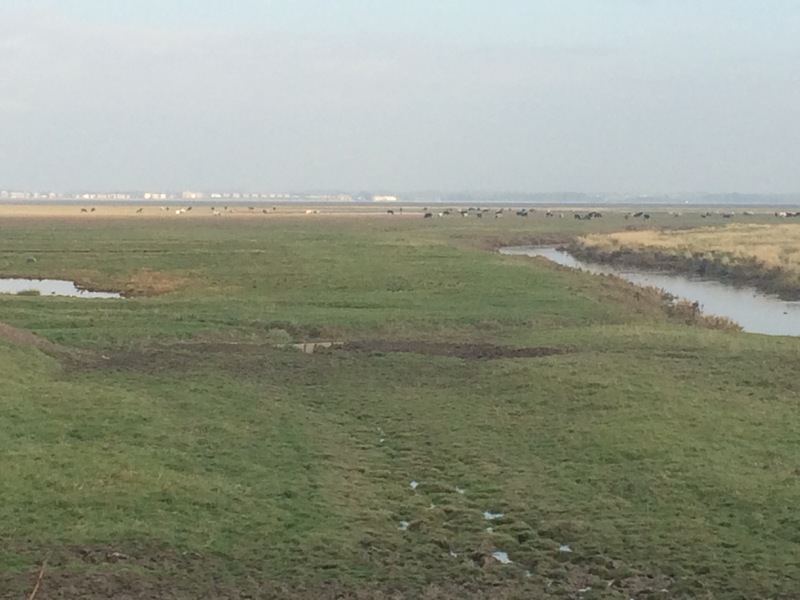 I walked along the edge of the River Ribble marshland to get to my campsite, just on the outskirts of Warton. This was possibly the worst campsite I’ve stayed at yet and, weirdly, really quite busy. I booked in at the saloon bar, which was a homage to all things Wild West (there was also a shop that sells Stetsons amongst other things but that was shut). Unfortunately it was populated by Neanderthals (I thought they were extinct but it seems they live on in this place). The presence of an outsider was clearly the cue for lewd comments. I pitched my tent behind some trees where it couldn’t be seen and hunkered down for the night. The shower block was filthy and the price I paid was a rip-off. I shan’t hurry back that’s for sure. 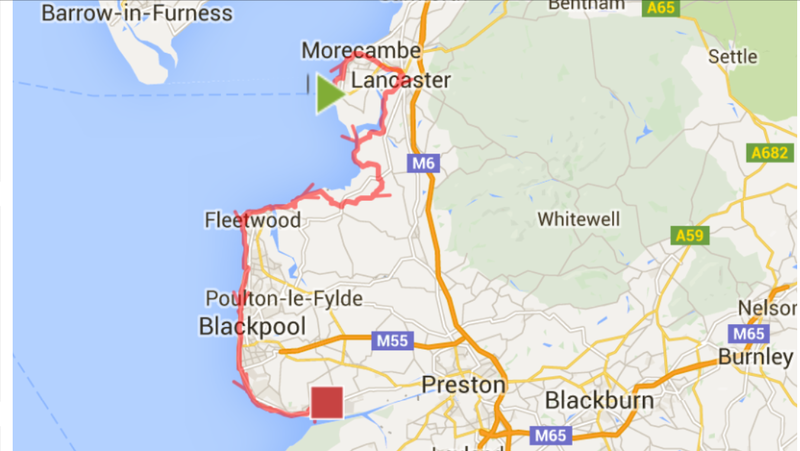 Zephyrine kindly gave me a lift to Aldcliffe, a village just outside Lancaster, where the coastal path heads off-road. 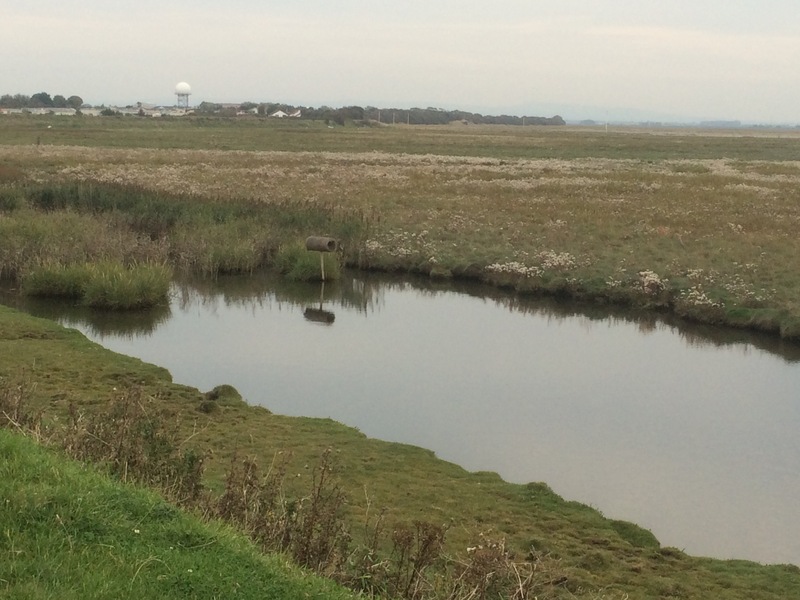 The first hour was spent walking a disused rail line all the way to Glasson, a small port near the mouth of the River Lune. Here is stopped at the Lantern O’er Lune cafe for brunch and was treated to the best full-English breakfast that I’ve had for a while. 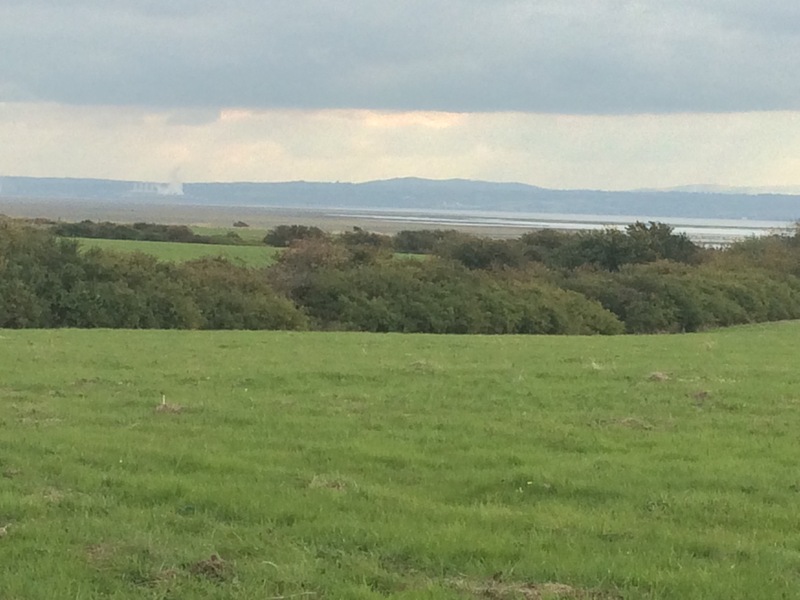 I left Glasson with a spring in my step and enjoyed the walk around Cockerham Sands, listening to the wading birds and looking back at Heysham Power Station. 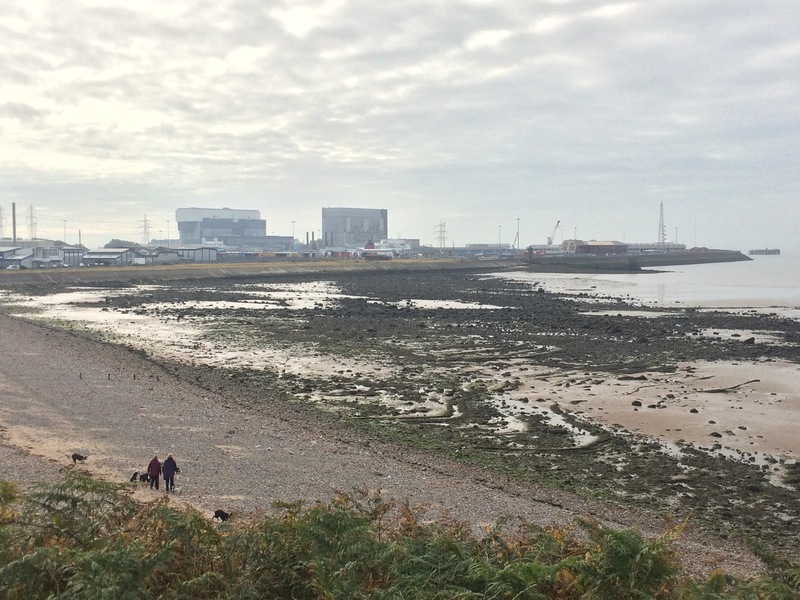 Heysham Power Station – it looks possible to walk there across the sand! 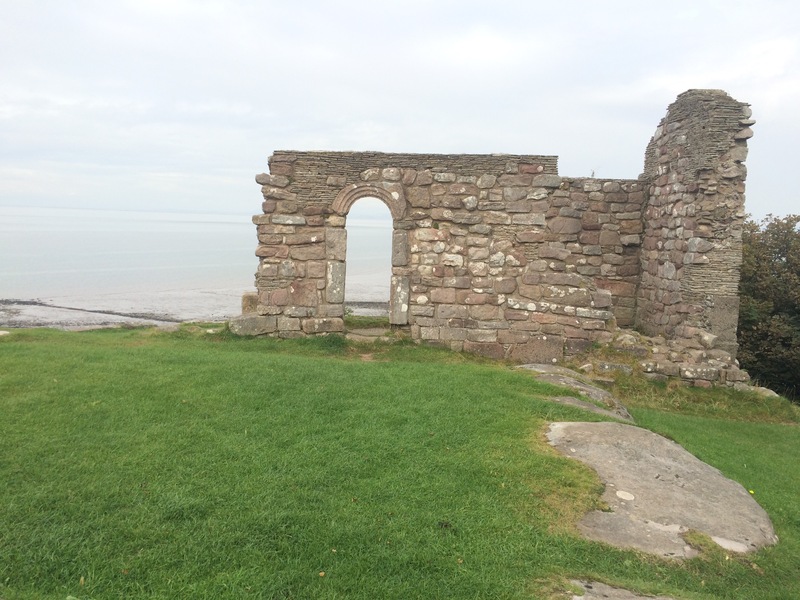 I stopped to look at Cockersand Abbey, which began life as a hermitage for someone called Hugh Garth back in 1180. 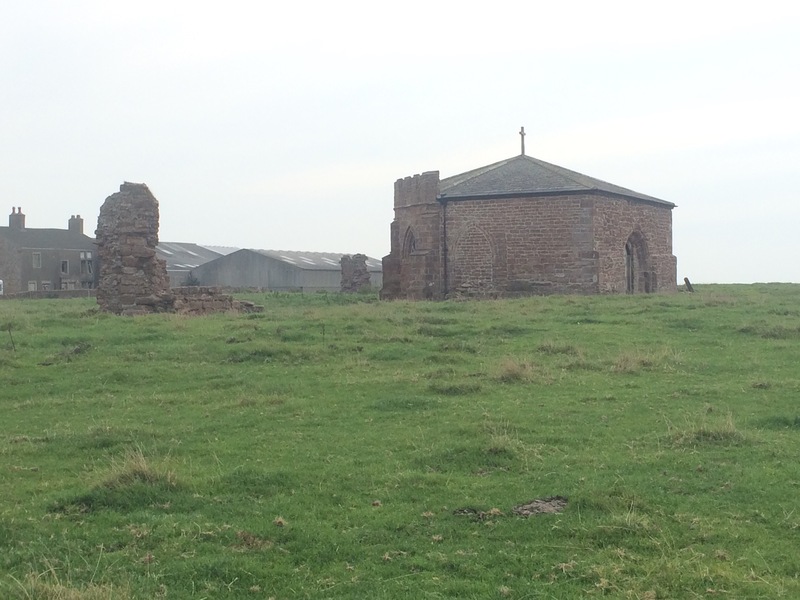 All that’s left now is the chapter-house, in the middle of a field of cows. 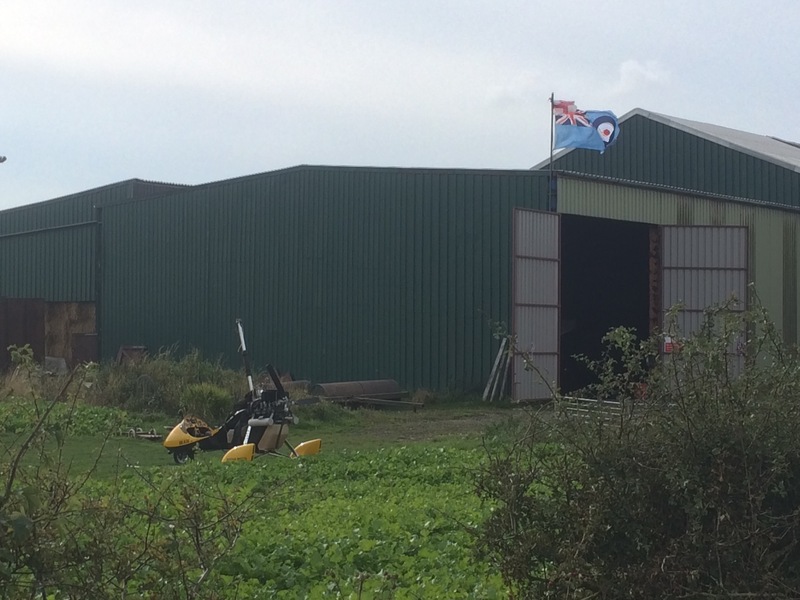 I kept passing farms that looked new and seemed to combine farming with parachuting, power parachuting and small aircraft. The skies were full! 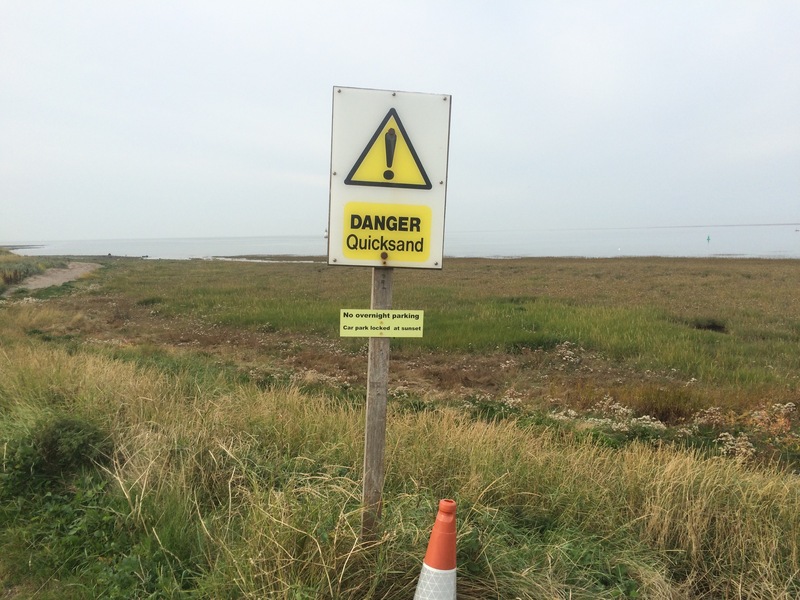 The Lancashire Coastal Path had been going so well and then the signs ran out. I think people in the houses by the path might remove them. 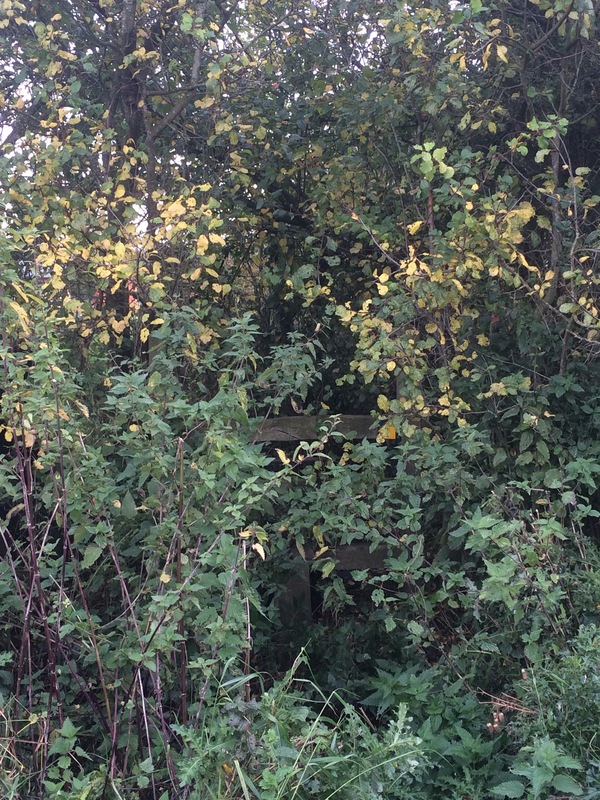 I spent half an hour trying to find my way to Pilling and eventually had to walk through someone’s garden (that was the path route) and climb over stiles that were overgrown with nettles and bushes. Can you see the path? 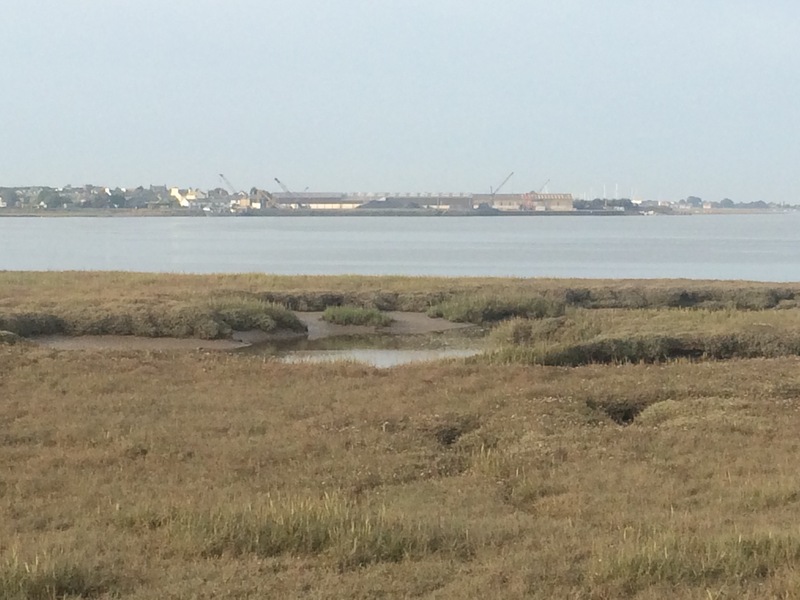 From Pilling the last few miles were along the sea wall (memories of Essex). 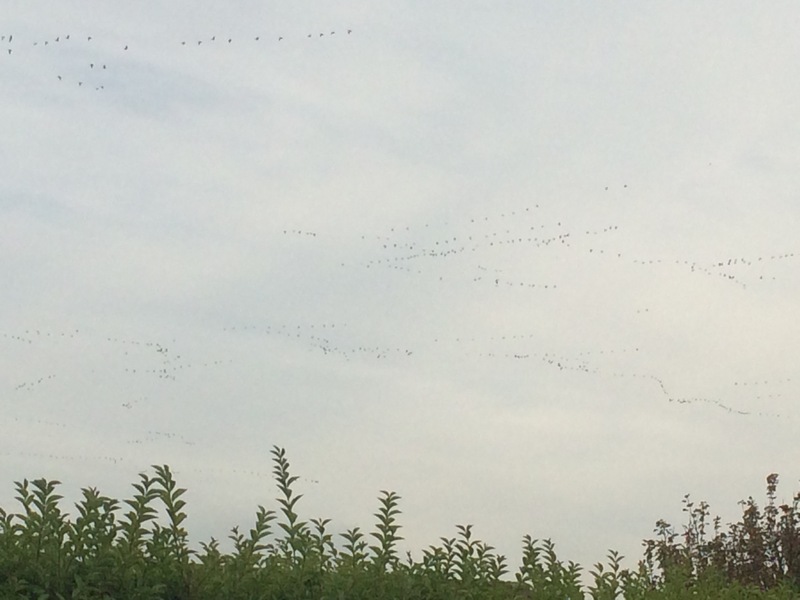 At 3.15 pm the sky was suddenly filled with about 1000 geese all flying in numerous V formations onto Pilling Marsh. It was an impressive sight, and noisy. 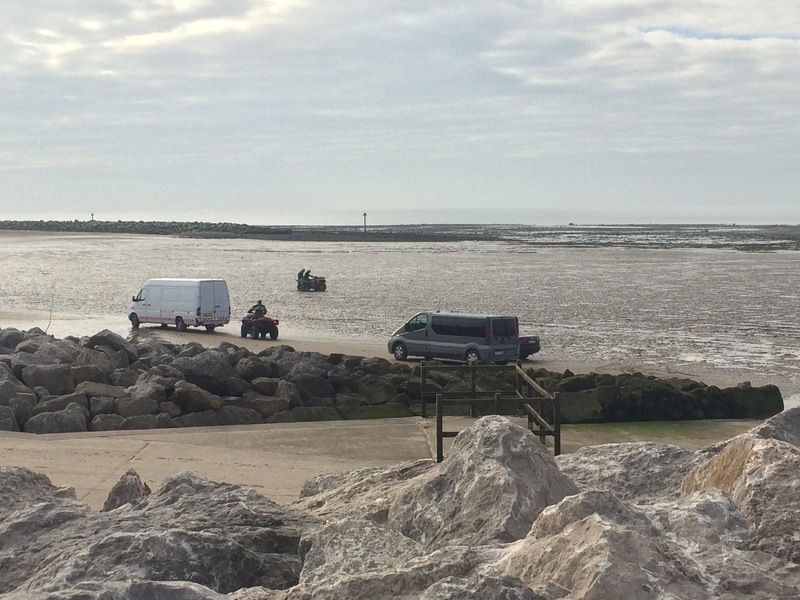 The tide was out and I saw runners and horse riders on the sands. I arrived at the campsite, pitched my tent and headed to the local pub (1.5 miles away) for some dinner and to watch the rugby. A good day all in all. Diane dropped me off at the ferry terminal in the morning and bought me a coffee while I checked in. (It should have been the other way around, with me buying the coffee after I’d been hosted so well.) Annoyingly I had my camping gas confiscated (no checks on the way out to Mann!). The ferry was packed full and I ended up sat outside and then on the floor in a corridor. Fortunately it was only 3.5 hours. It was a grey day and trying to rain when I left Mann (perfect leaving weather) and still grey when I arrived back at Heysham. 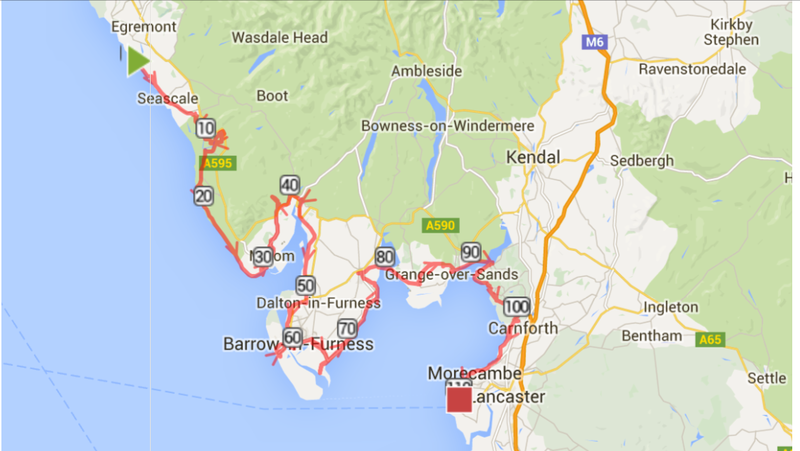 In order to cross the River Lune I had to head into Lancaster to the first bridge so I set off back along the coast into Morecambe rather than walk cross-country via a mixture of tracks and roads. I was glad I chose that option as it didn’t take long for me to find the Chapel of St Patrick, one of the oldest Christian monuments in NW England that was built in the 8th Century. It was on the top of the hill overlooking the Bay and had clearly been a burial site as there were several graves cut in the rock. Strangely, on the lower ground next to the chapel was the Parish Church of St Peter, founded around 967. Two ancient religious building in one small village. How unusual. 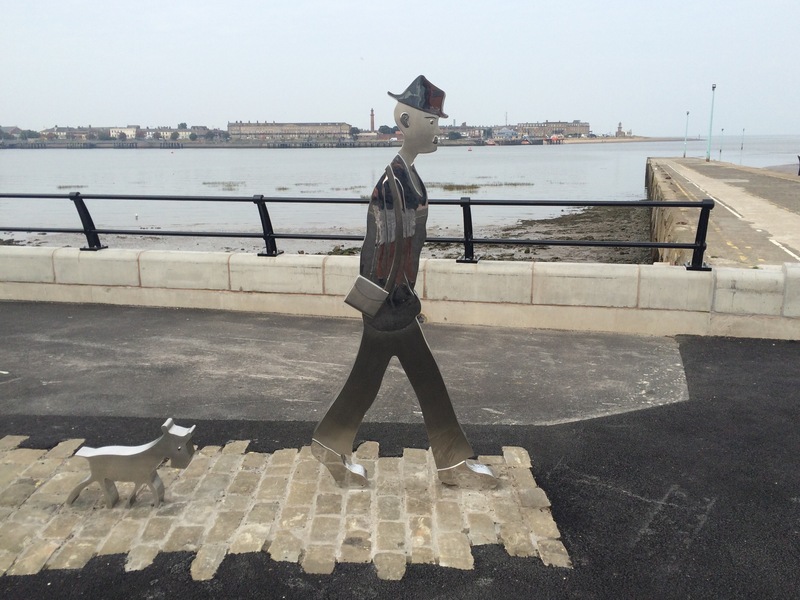 I enjoyed my stroll back along the Morecambe promenade to the old train station. Here I turned inland and walked the start of the Way of The Roses, along the disused railway line, into Lancaster. 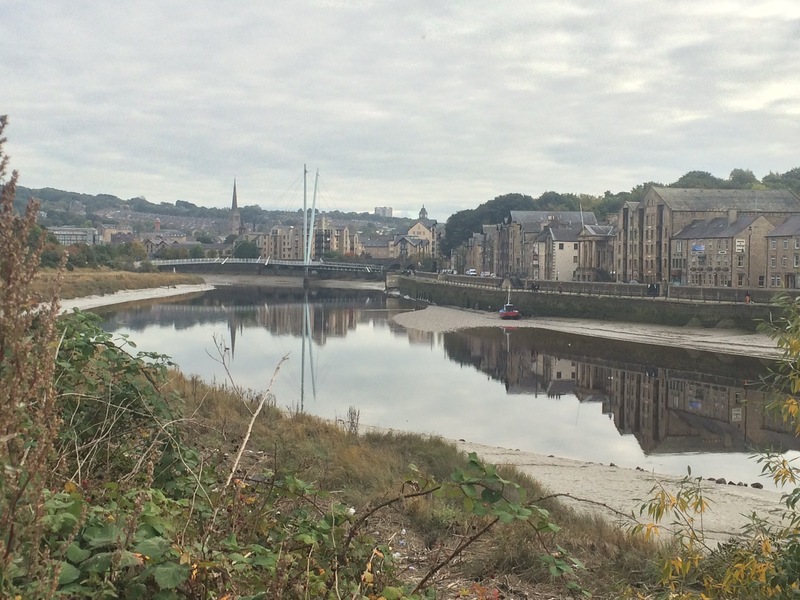 I crossed the River Lune via the pedestrian bridge and headed into the centre of the city to find a post office. Chores done, I walked to Zephyrine’s house and was treated to another night of lively debate, and good company. 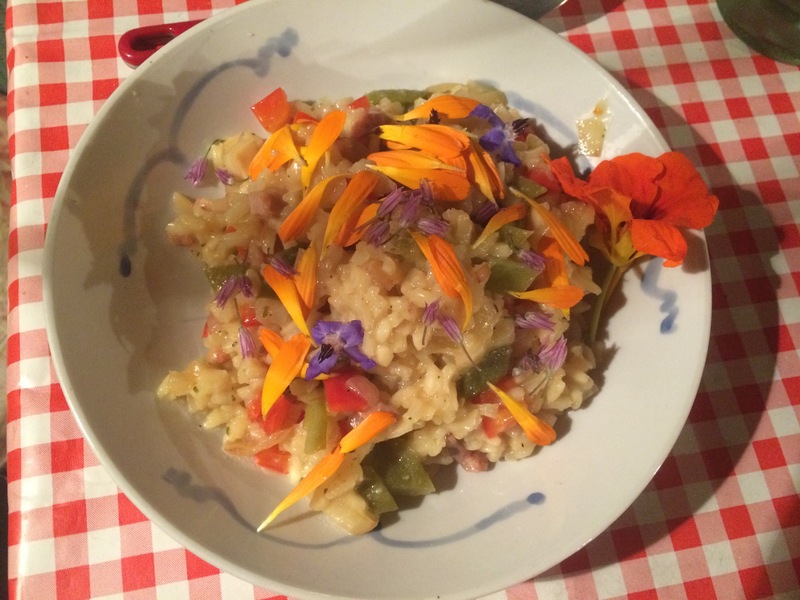 What a strange and interesting week! I had my time and enjoyment influenced by lots of different people this week, not by design but just because that’s what happened. All but one of the people I met was so friendly, kind and helpful; it really made for a memorable week and I’m very grateful to all of them. 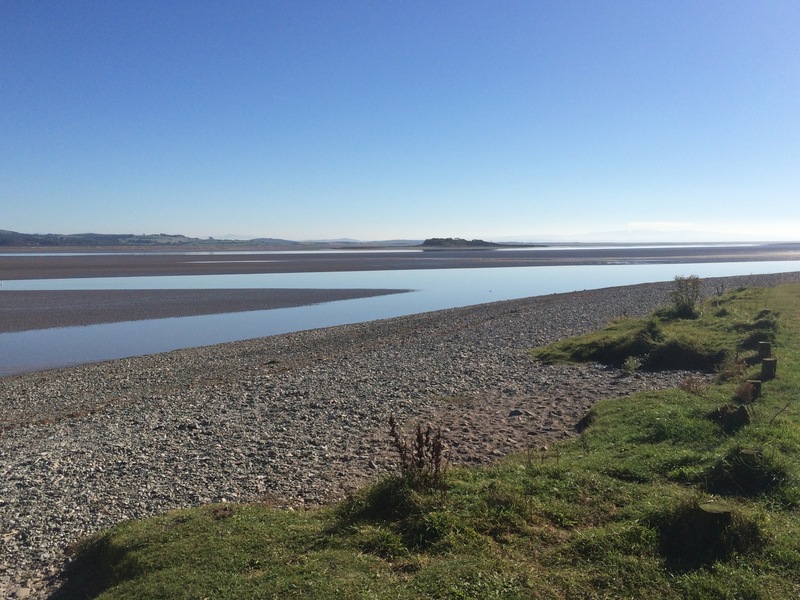 The walking this week was dominated by Duddon Sands and Morecambe Bay, and the rivers that flow into them that have to be crossed. 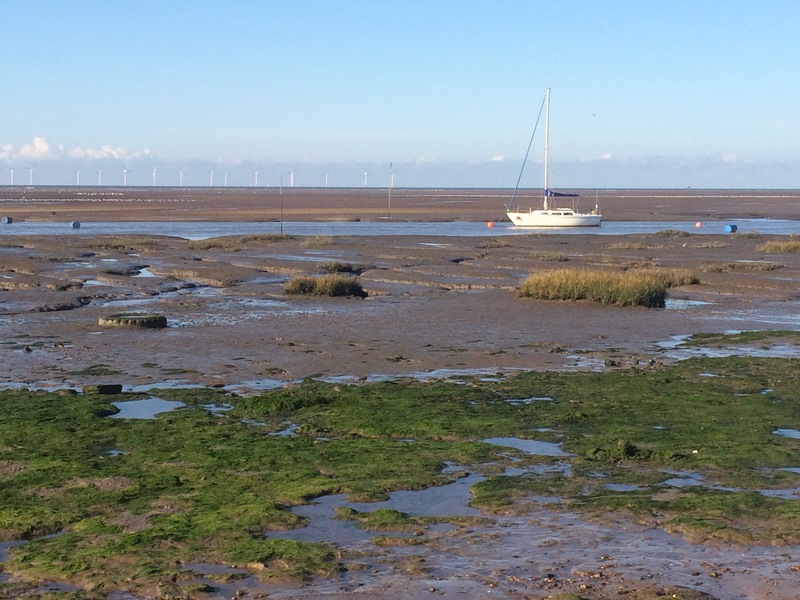 I avoided all danger (and muddy feet) by eschewing any path that crossed river beds or the sands at low tide. It is a beautiful area: on the edge of the Lake District but not as popular with tourists. 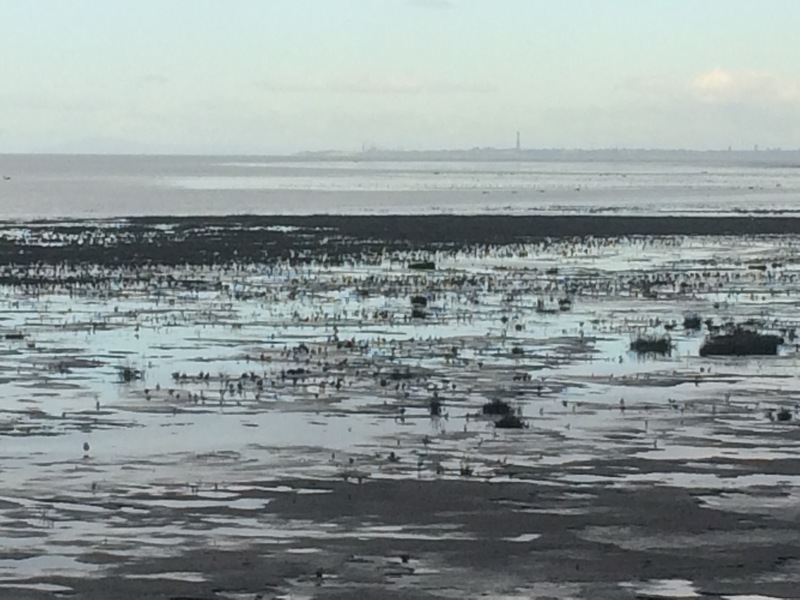 If I come back again I would like to visit Piel Island and to hire a Queen’s Guide to walk me across the sands, avoiding the quicksand and the rushing tide. 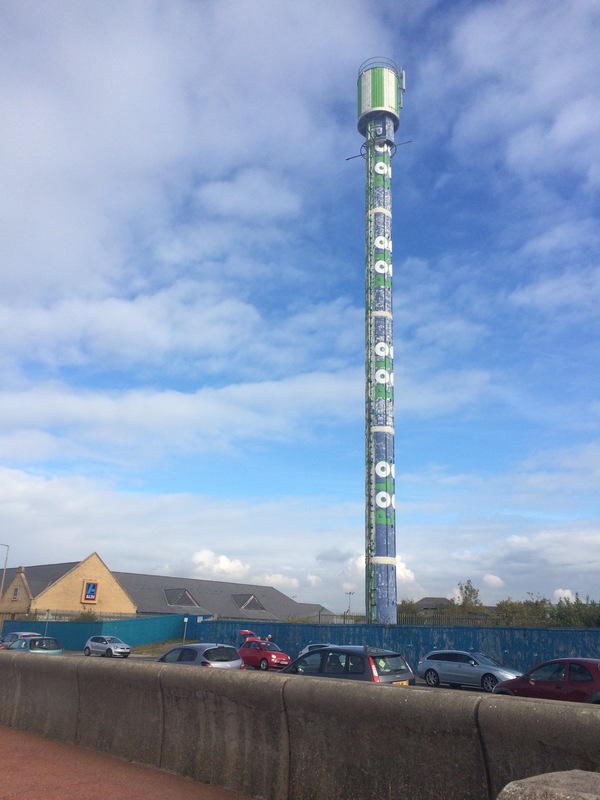 London has the Oxo Tower, Morecambe has a polo tower! Zephyrine very kindly offered to drive me to Heysham Port to catch the ferry to the Isle of Man. 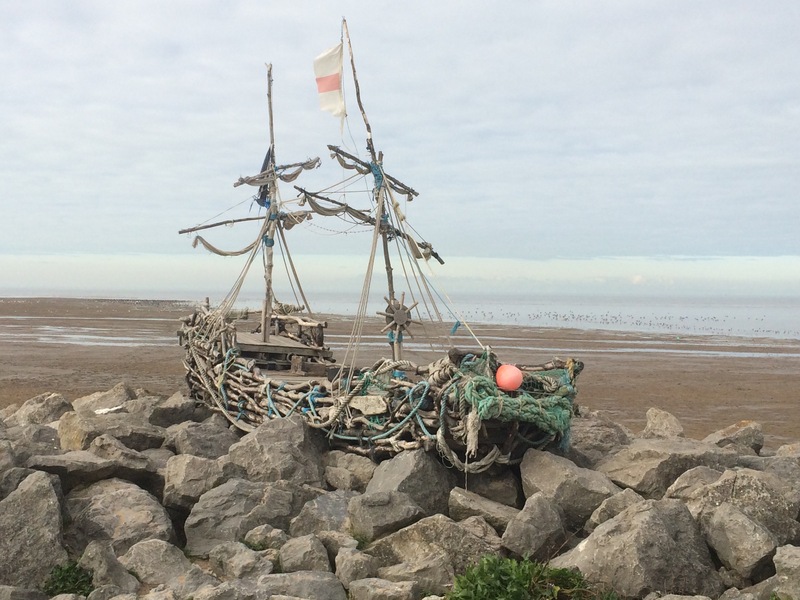 There was just enough time to take a quick trip to the Half Moon Bay Cafe on the shore of Half Moon Bay, Heysham. 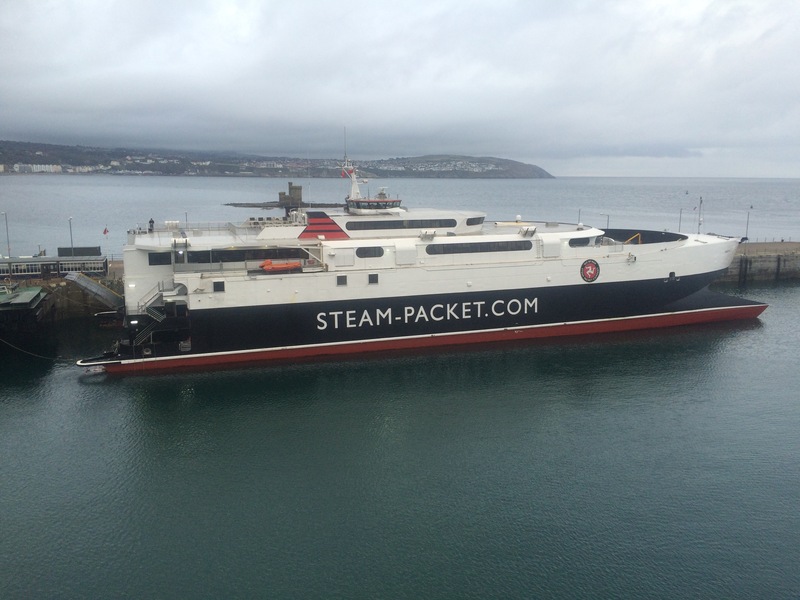 I had decided a couple of weeks ago that as I was passing through Heysham I would take a trip to the Isle of Man. Luckily I have a friend who lives there and she offered to host me for the duration of my stay. What a great opportunity to see her and see Mann. I leapt at the chance. 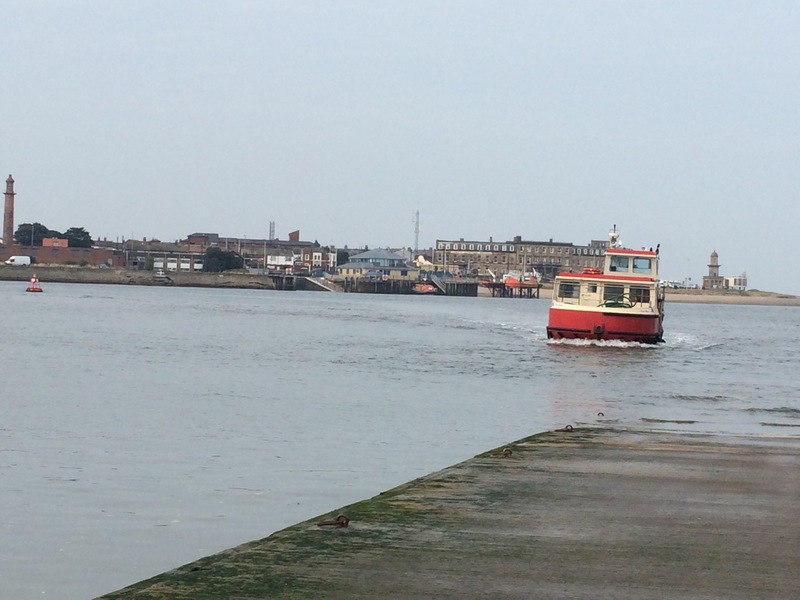 Today’s ferry was the sea cat – super fast and comfortable on a calm day. It was a bit misty so the views weren’t great and I took the opportunity to do a spot of planning. By the time I arrived in Douglas, mid-afternoon, the sun was just breaking through and it was perfect weather for a coastal walk. 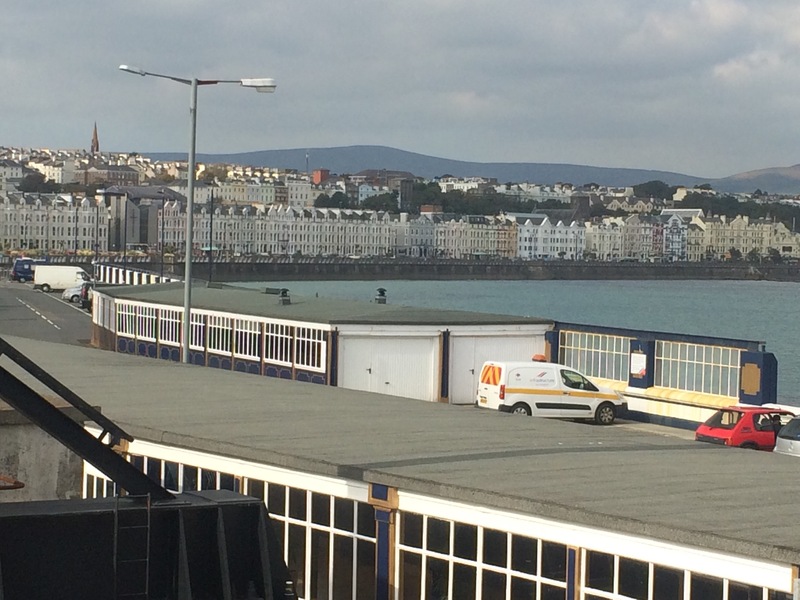 Douglas has quite an impressive sea front with its tall hotels facing the sea. When I got a bit closer I could see some of its faded glory but it looks like it’s time is coming again. 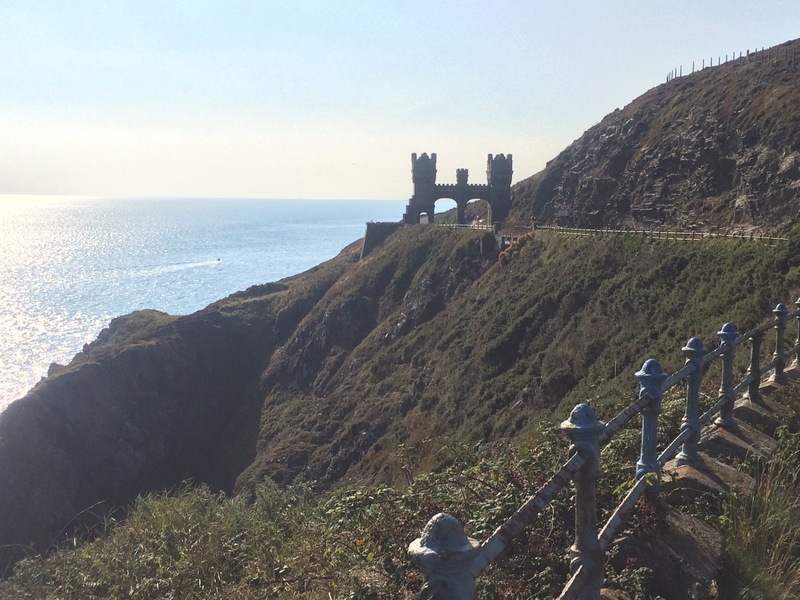 From the ferry terminal I walked up to the cliff top and admired a war memorial there. Unlike all the other war memorials I have seen, commemorating the Great War, this one was for the 69 Manxmen killed alongside Nelson in the Battle of Trafalgar. 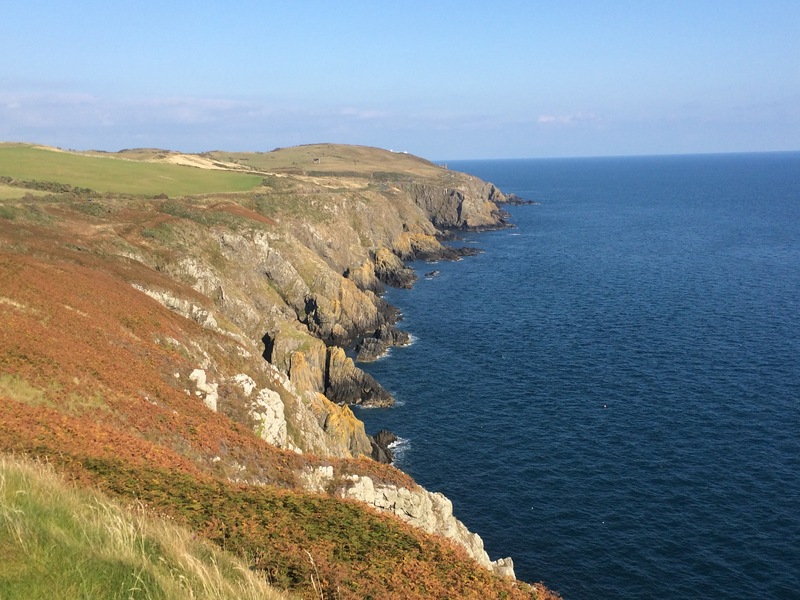 The Isle of Man has a 95-mile long coastal path (called Raad Ny Foillan in Manx Gaelic) and I walked 7 of those miles. It was a beautiful walk along the cliff top road (no longer open to vehicles) called Marine Drive staring at the sea and the sky. 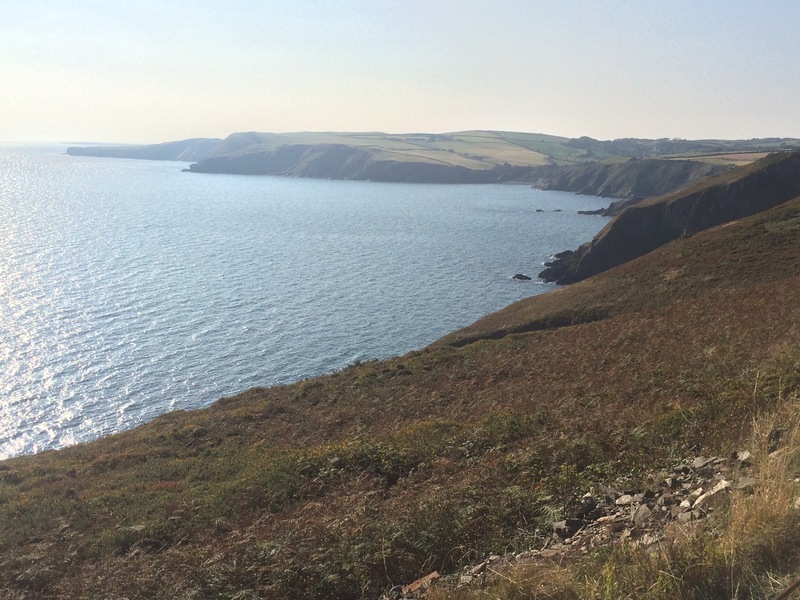 At Port Soderick the path headed inland along one of the beautiful wooded glens that Mann has. I crossed over the railway line for the steam train (which I saw twice) and cut across Santon Head towards Port Grenaugh, past a big posh house, where I was meeting Diane. It had been a lovely walk to begin 4 days of sightseeing around the island, hosted by Diane and Colin and their family.